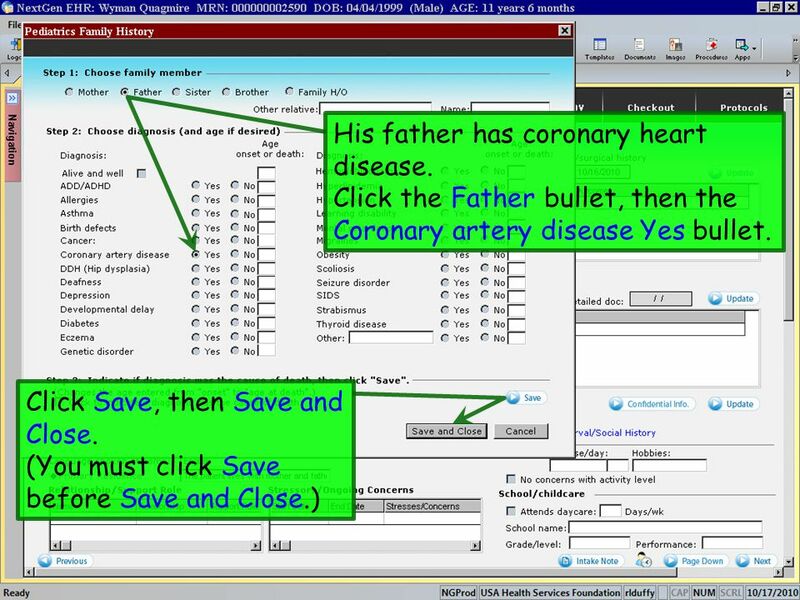 NEXTGEN WORKFLOW DEMONSTRATION Well Child Visit (Family Medicine Template Set) This demonstration works through a sample well child visit, introducing. 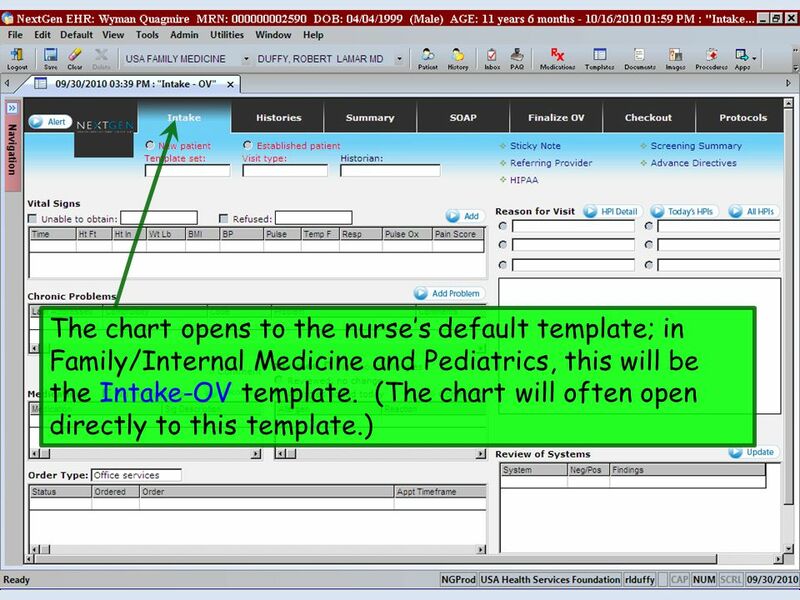 This demonstration works through a sample well child visit, introducing the new user to the general workflow. 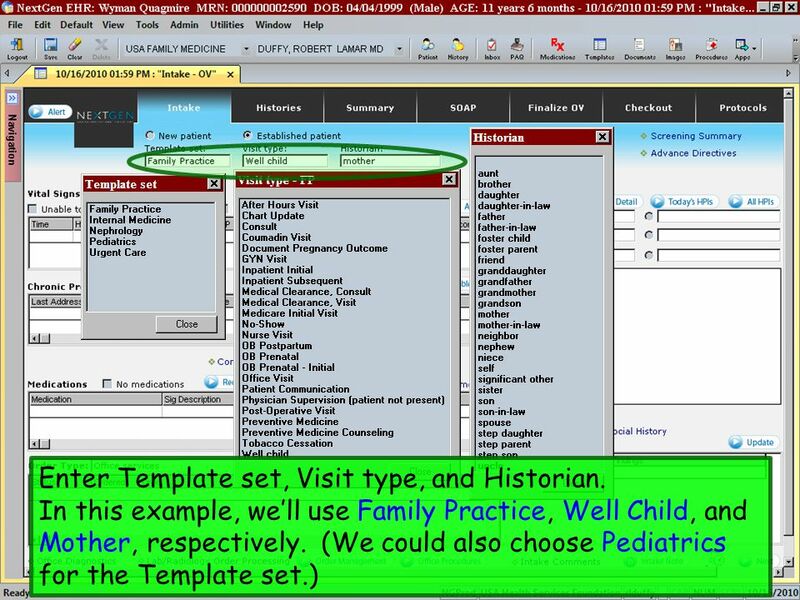 While it uses the Family Medicine Template Set, use of the Pediatric Template Set would present very few differences. 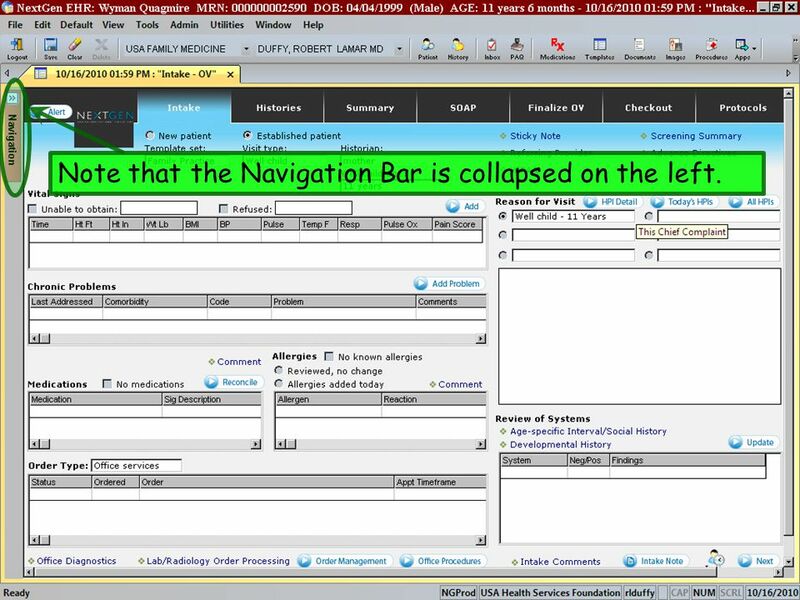 This has been prepared with EHR x and KBM Subsequent updates may display cosmetic and functional changes. Slides are updated if the changes are pertinent to the points being illustrated. Use the keyboard or mouse to pause, review, and resume as necessary. There is no audio with this exercise. 3 Some users may see an alert like this. 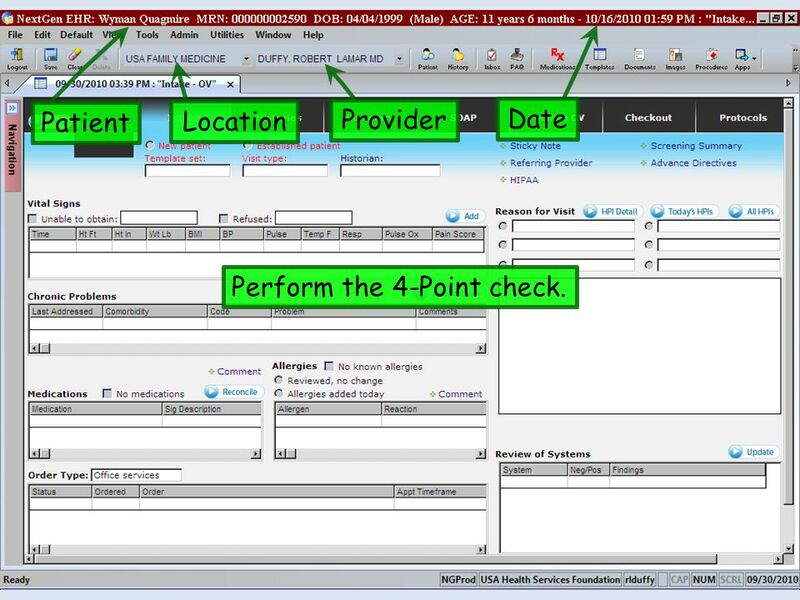 If so, just click OK.
5 Patient Location Provider Date Perform the 4-Point check. 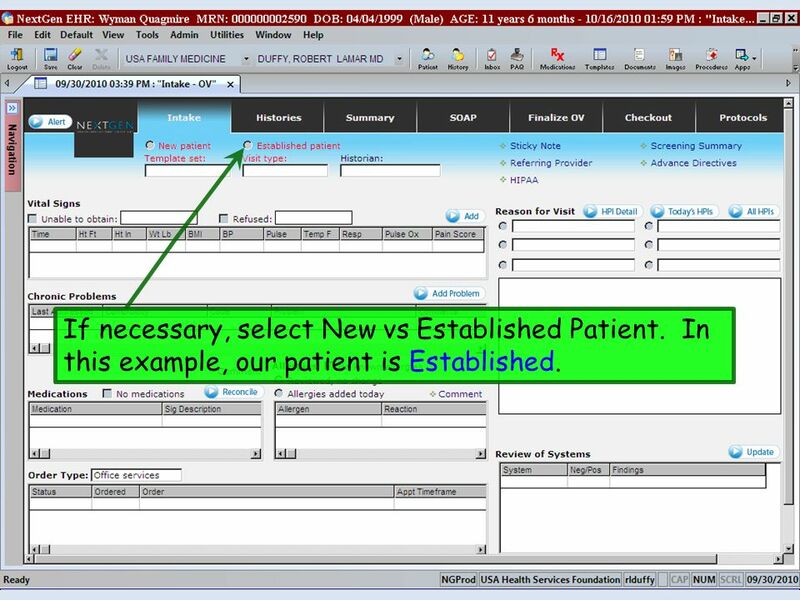 If necessary, select New vs Established Patient. In this example, our patient is Established. 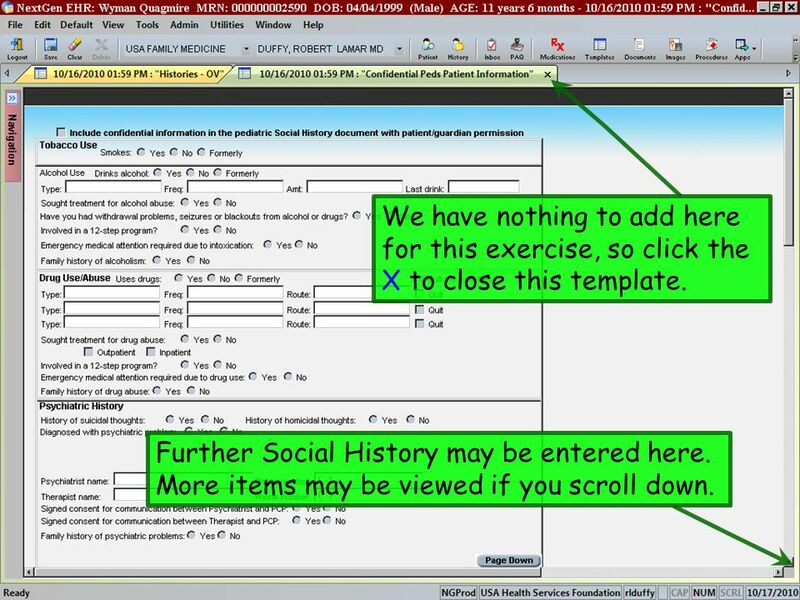 7 Enter Template set, Visit type, and Historian. Since this is a Well Child Check, you will be prompted for the age. Pick 11 years. 9 Note that the Navigation Bar is collapsed on the left. It will slide out if you hover over it. 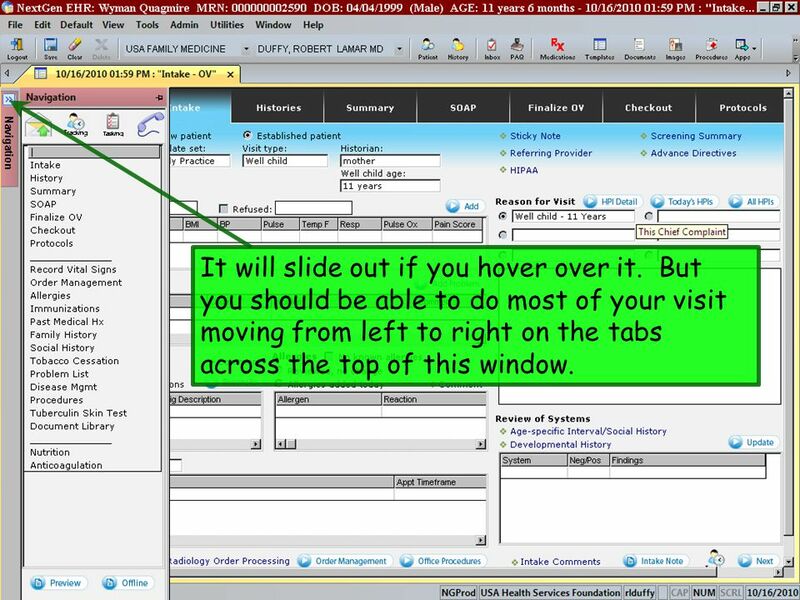 But you should be able to do most of your visit moving from left to right on the tabs across the top of this window. 11 Also note the History Bar may not display by default on the right. 12 You can display and hide it by clicking the History button. This helps make better use of the full width of the screen—especially useful when working on a smaller computer. 13 Note the Alert button; click this to review. 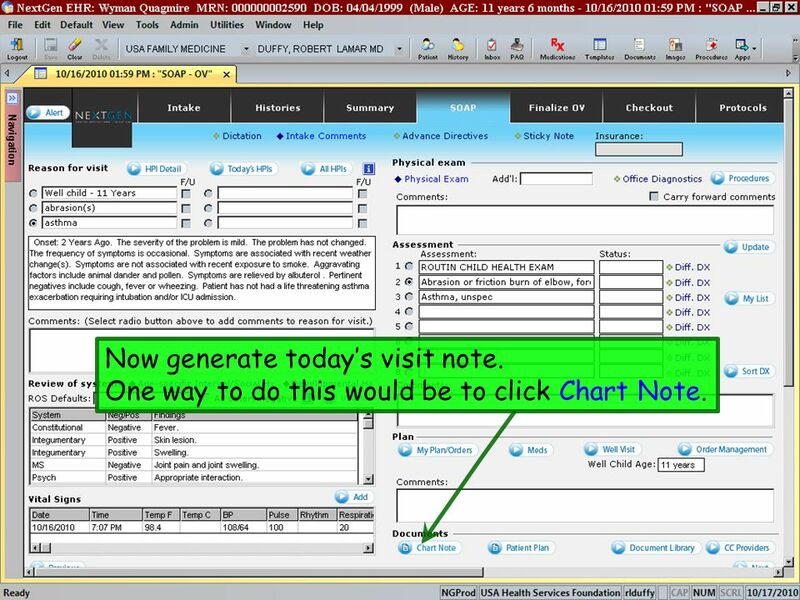 14 This gives you the opportunity to indicate several noteworthy alerts about the patient. 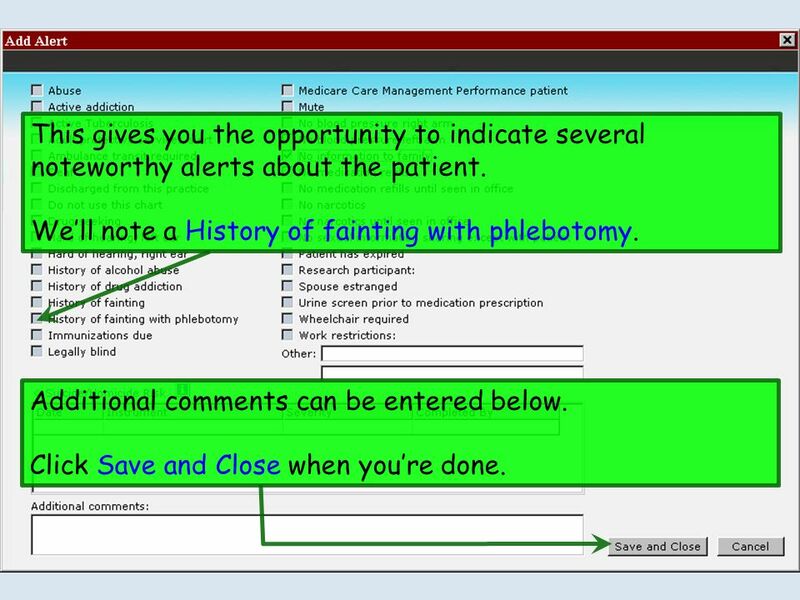 We’ll note a History of fainting with phlebotomy. Additional comments can be entered below. Click Save and Close when you’re done. 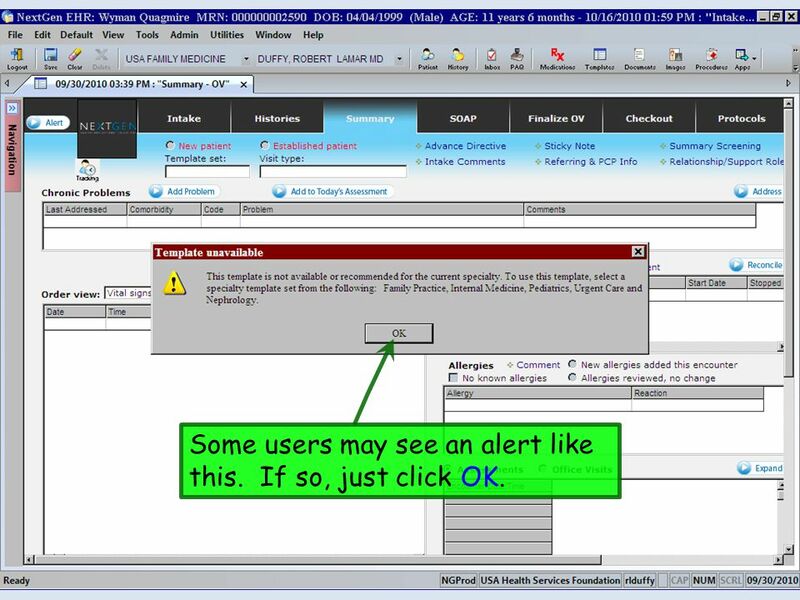 15 If an alert has been entered, the button will change from a white and blue oval to a red rectangle. This is visible on other tabs as well. Also note the Sticky Note link; click this to review. 17 If a Sticky Note has been entered, the link changes to a lighter blue, and there is a solid diamond next to it. These alerts and sticky notes will now be removed. 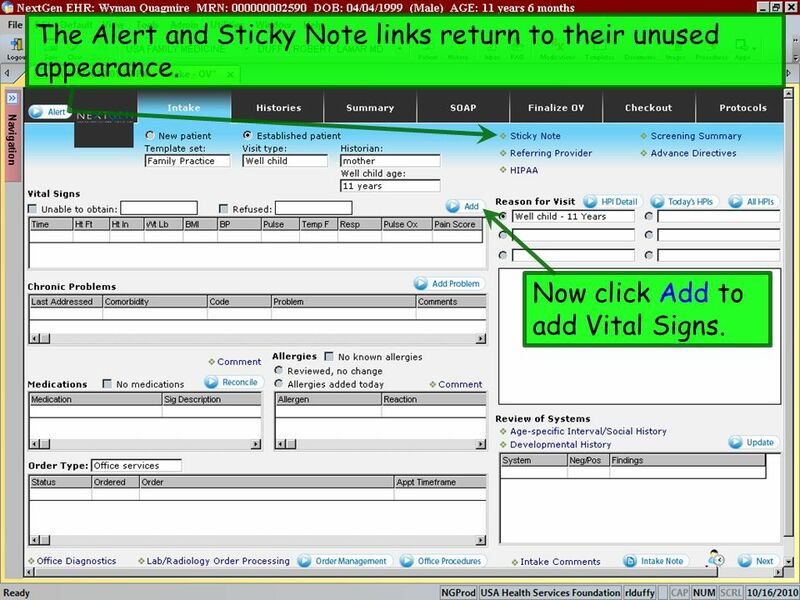 18 The Alert and Sticky Note links return to their unused appearance. Now click Add to add Vital Signs. Data used in this example: Ht 56 inches, measured today. Wt 75 lbs, dressed without shoes. T 98.4, ear. BP 108/64 sitting, left arm, manual pediatric cuff. HR 100, regular. Resp 20. 20 BMI and the Height, Weight, and BMI percentiles are automatically calculated. 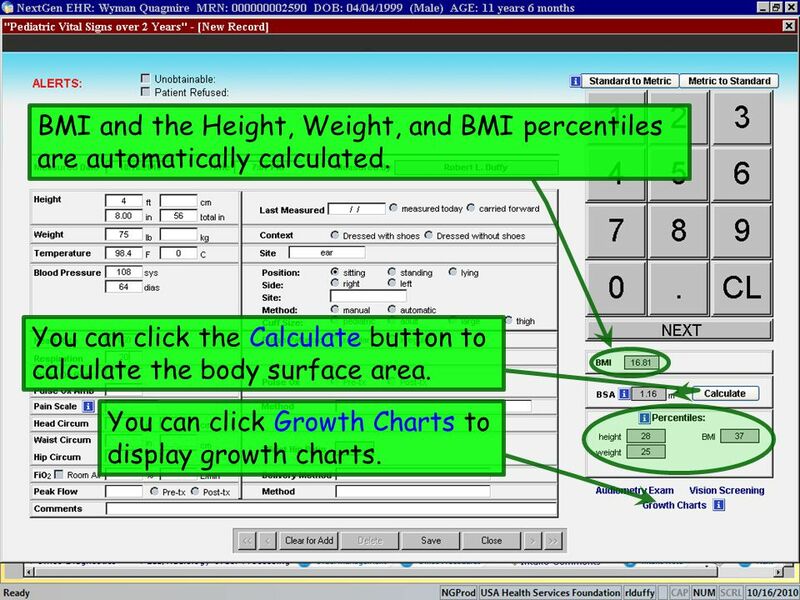 You can click the Calculate button to calculate the body surface area. You can click Growth Charts to display growth charts. 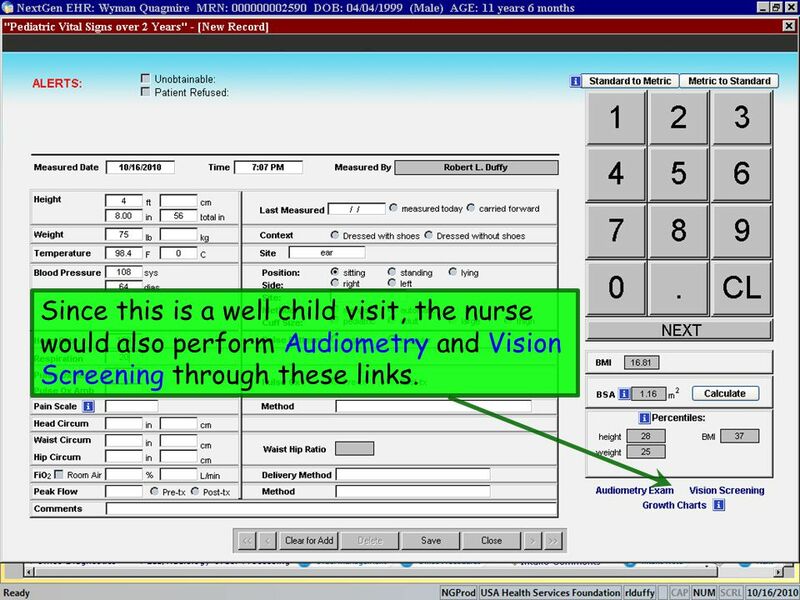 21 Since this is a well child visit, the nurse would also perform Audiometry and Vision Screening through these links. 22 Enter results. 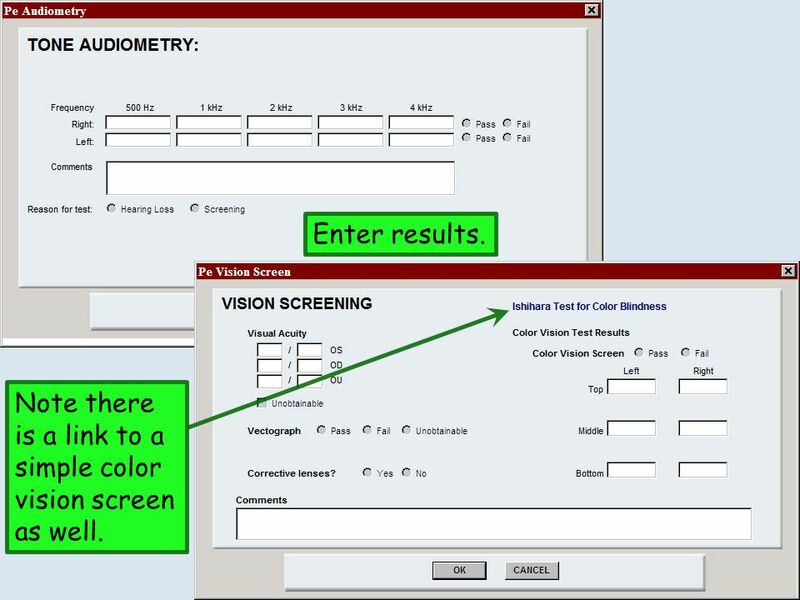 Note there is a link to a simple color vision screen as well. 23 When done click Save and Close. Review the patient’s chronic medical problems. To add problems, click Add Problem. 25 There are multiple ways to search for problems. 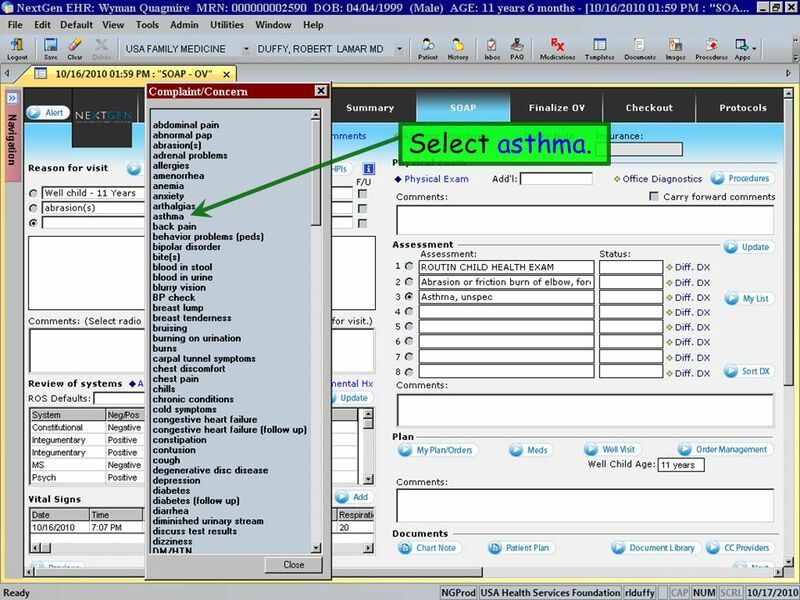 Our patient has asthma. For this example, click All to search for this diagnosis. The familiar search popup appears. 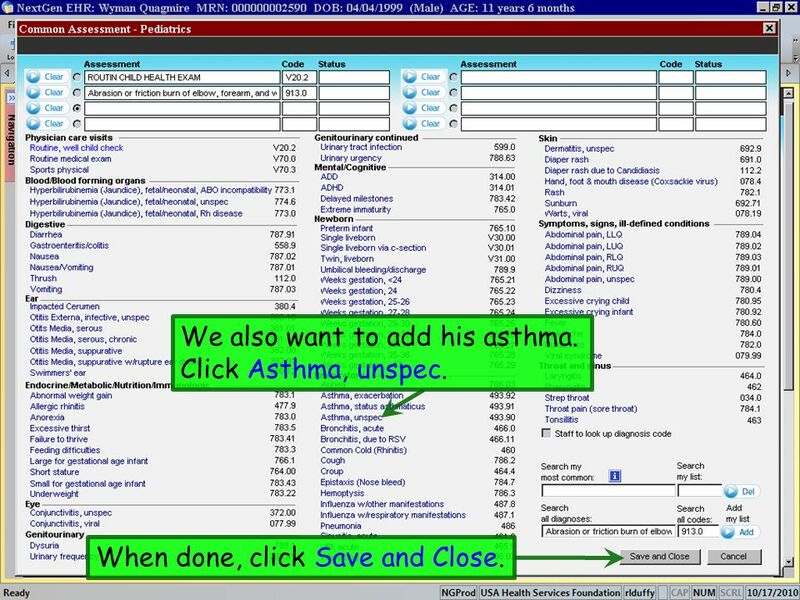 Using the method of your choice, search for asthma. 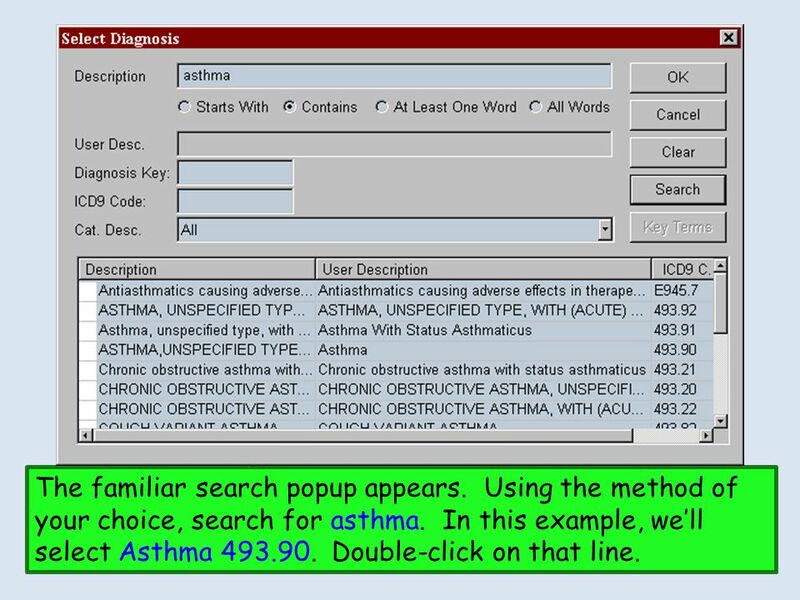 In this example, we’ll select Asthma Double-click on that line. 27 The diagnosis is displayed. Enter Date of onset and Additional information to the extent known/pertinent. 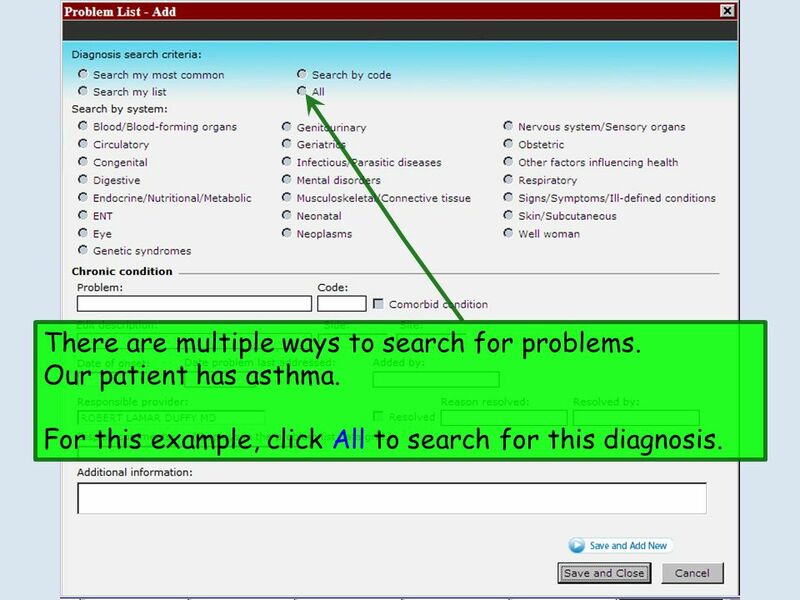 Click Save and Add New if you have other diagnoses to add. 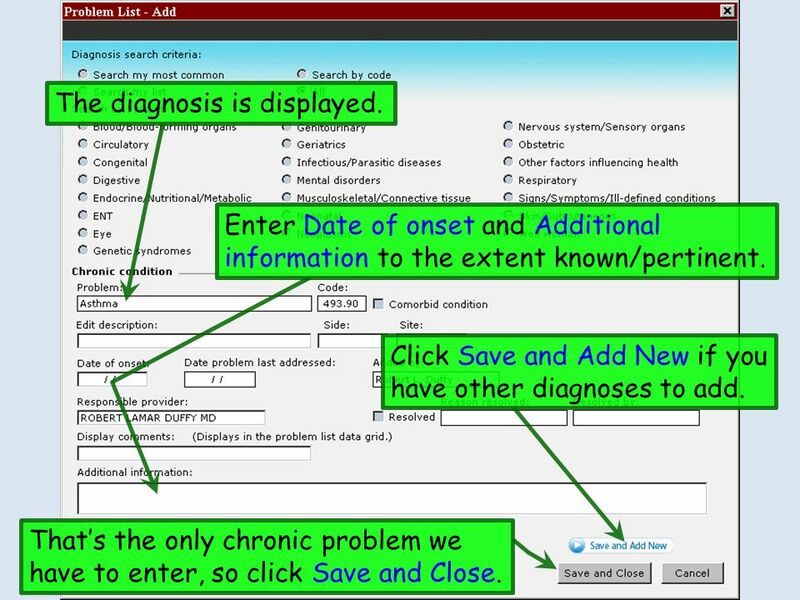 That’s the only chronic problem we have to enter, so click Save and Close. NextGen sometimes makes this a required field. 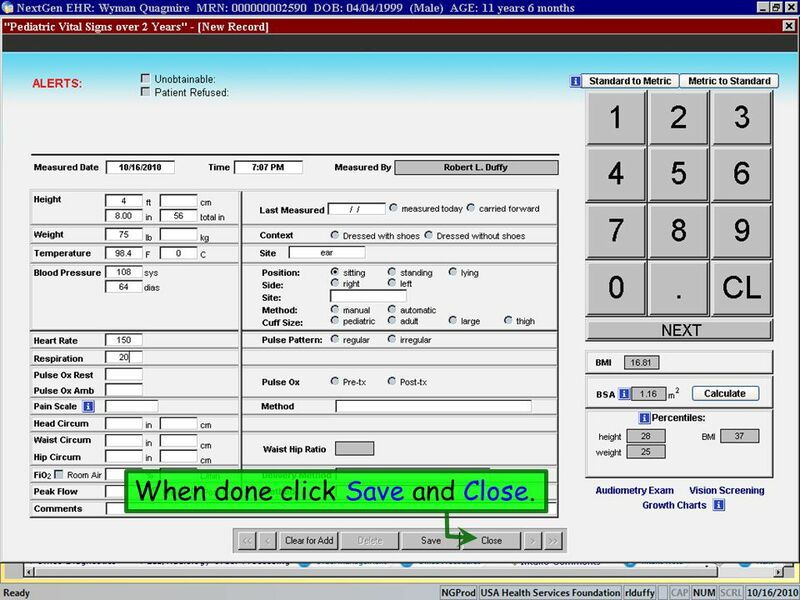 However, there are many times when you will be entering data such as this, but won’t know the Date of Onset, and may not have the patient available to ask. 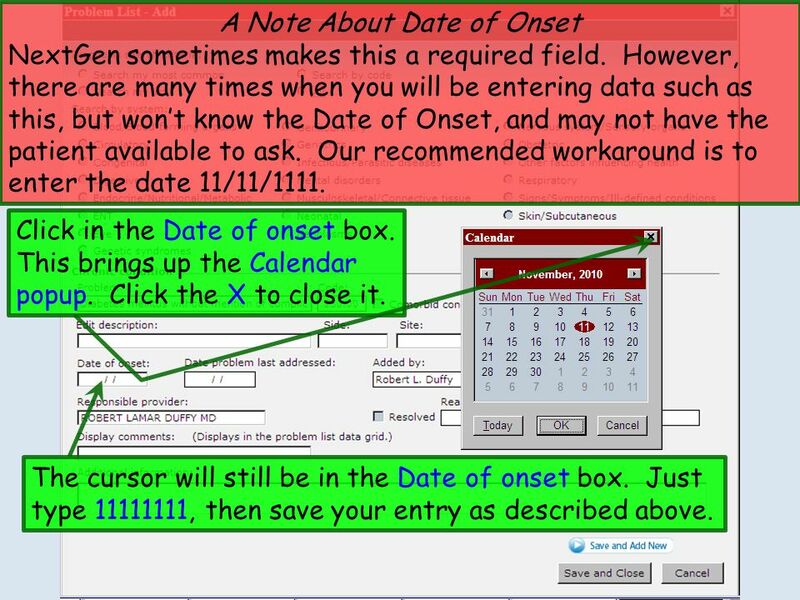 Our recommended workaround is to enter the date 11/11/1111. Click in the Date of onset box. This brings up the Calendar popup. Click the X to close it. The cursor will still be in the Date of onset box. Just type , then save your entry as described above. 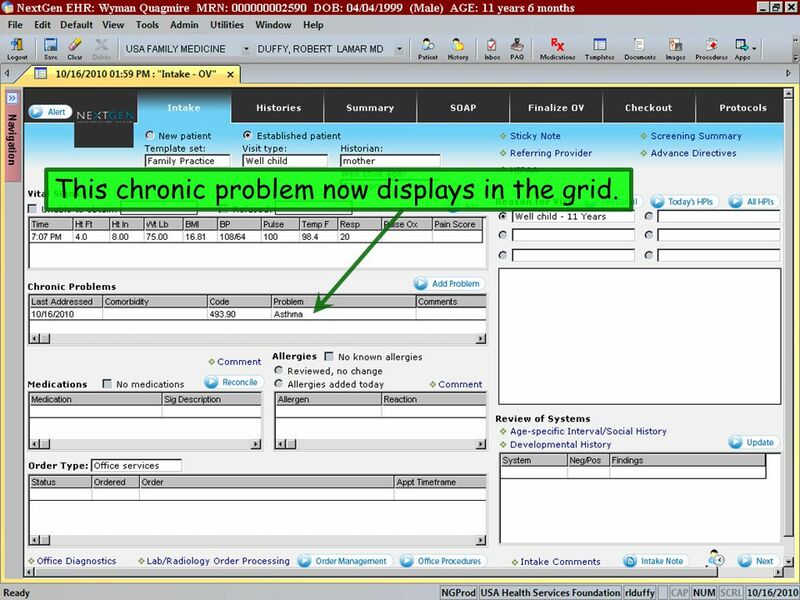 29 This chronic problem now displays in the grid. 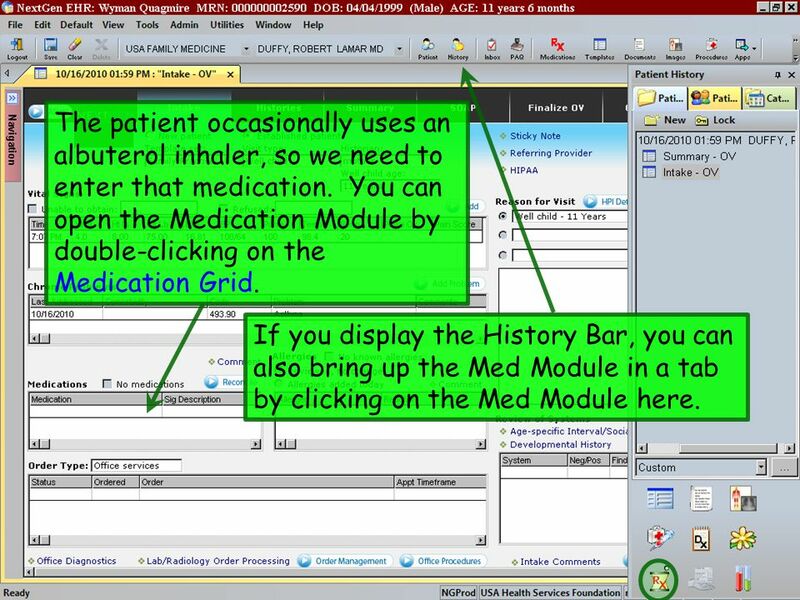 30 The patient occasionally uses an albuterol inhaler, so we need to enter that medication. You can open the Medication Module by double-clicking on the Medication Grid. 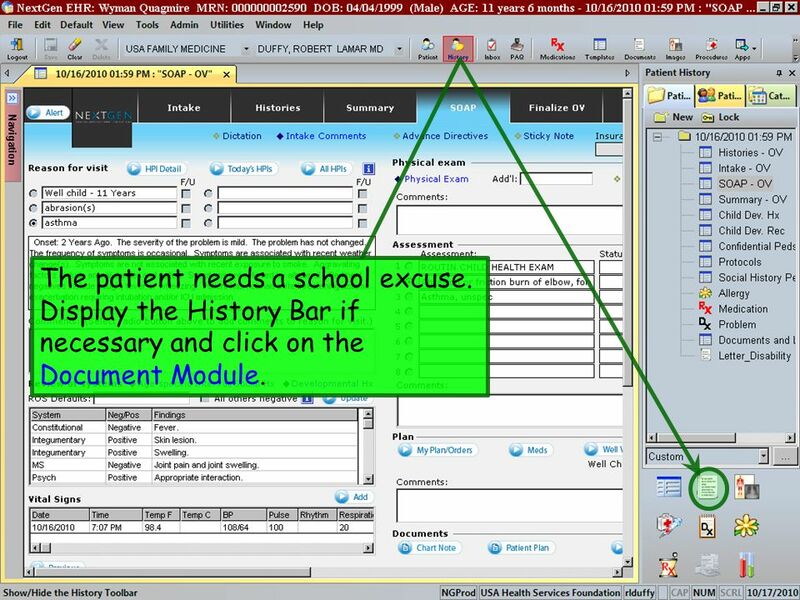 If you display the History Bar, you can also bring up the Med Module in a tab by clicking on the Med Module here. 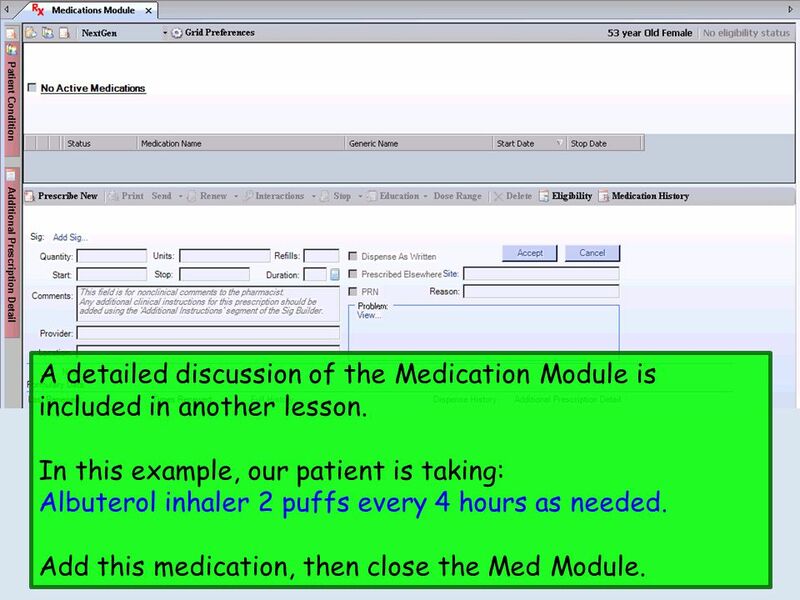 31 A detailed discussion of the Medication Module is included in another lesson. 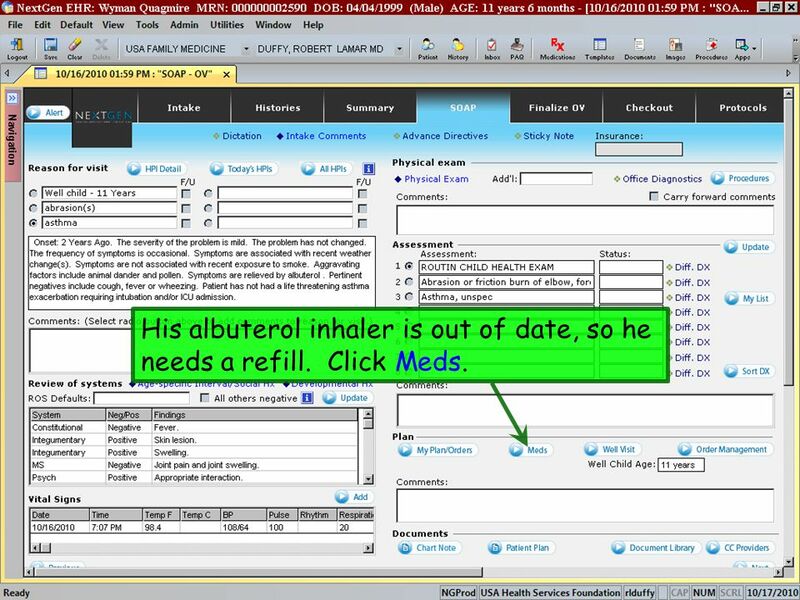 In this example, our patient is taking: Albuterol inhaler 2 puffs every 4 hours as needed. Add this medication, then close the Med Module. 32 This med now displays in the Medication grid. Next, review allergies. 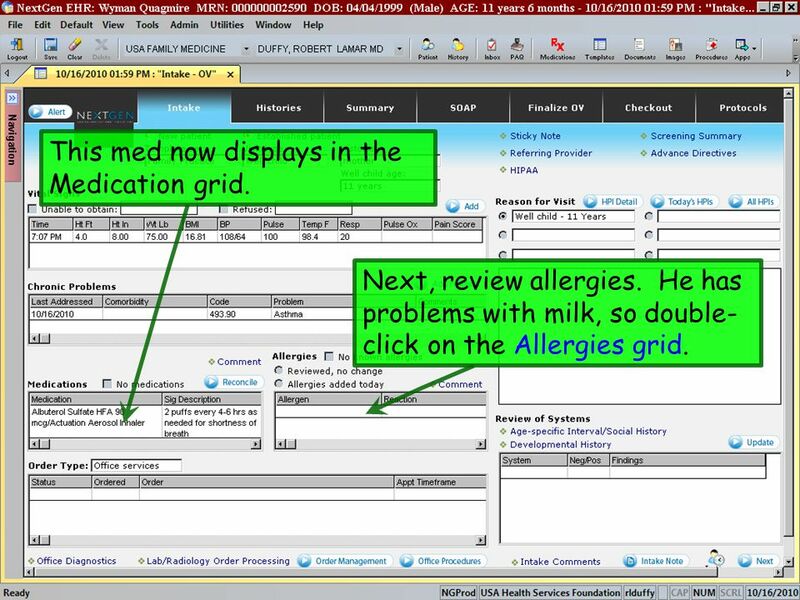 He has problems with milk, so double-click on the Allergies grid. Add the patient’s mild-moderate GI intolerance of milk. 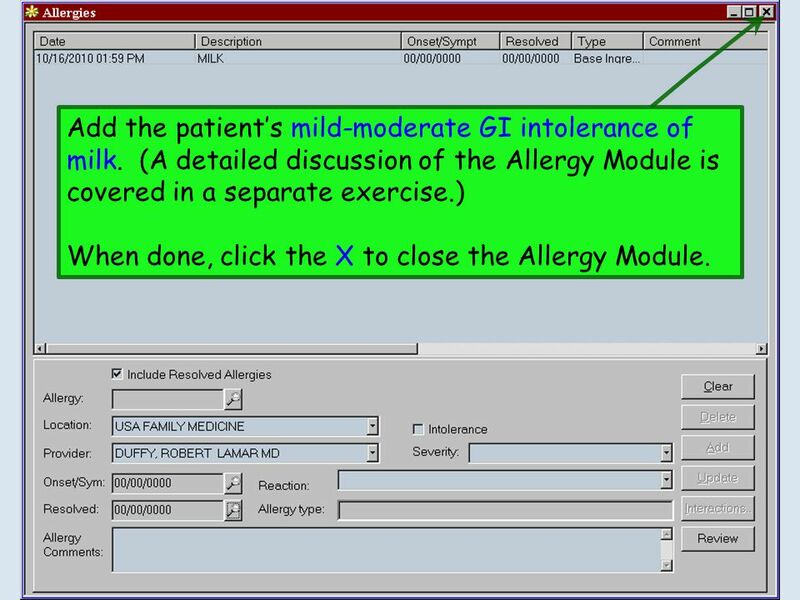 (A detailed discussion of the Allergy Module is covered in a separate exercise.) 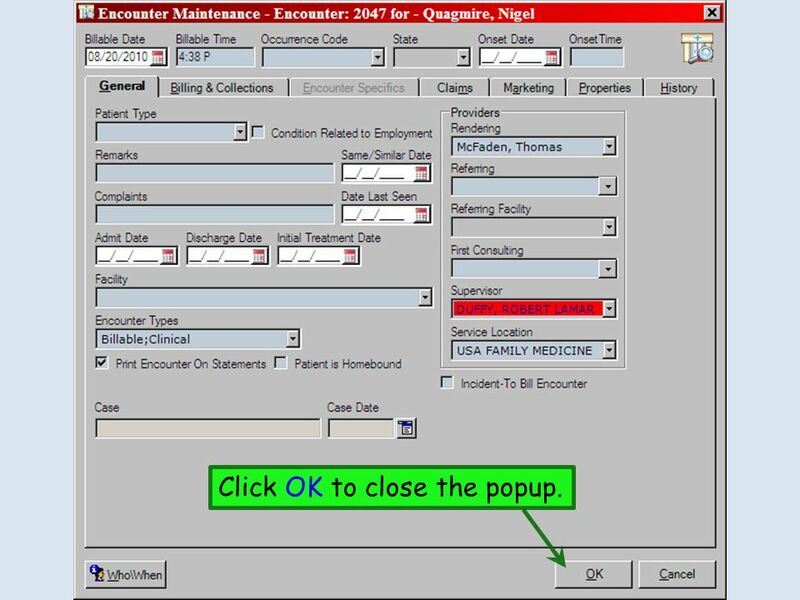 When done, click the X to close the Allergy Module. 34 Milk now displays in the Allergies grid. 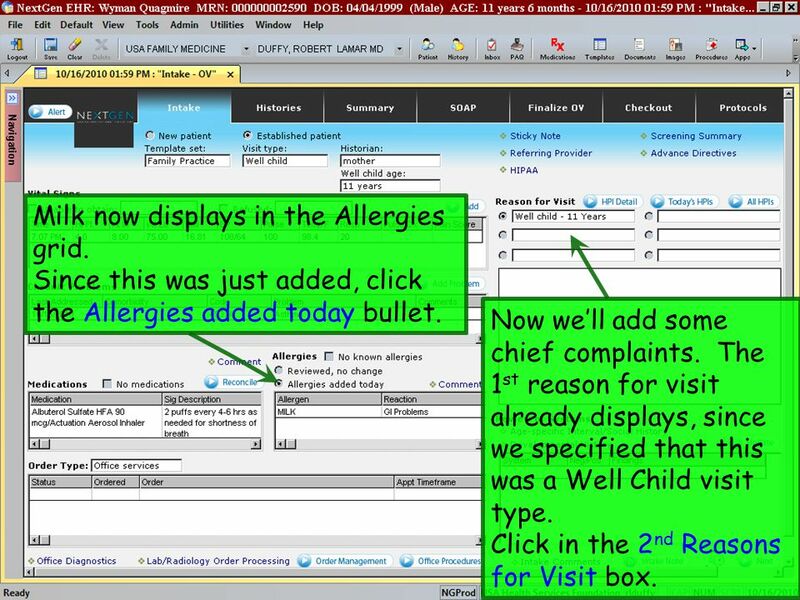 Since this was just added, click the Allergies added today bullet. Now we’ll add some chief complaints. 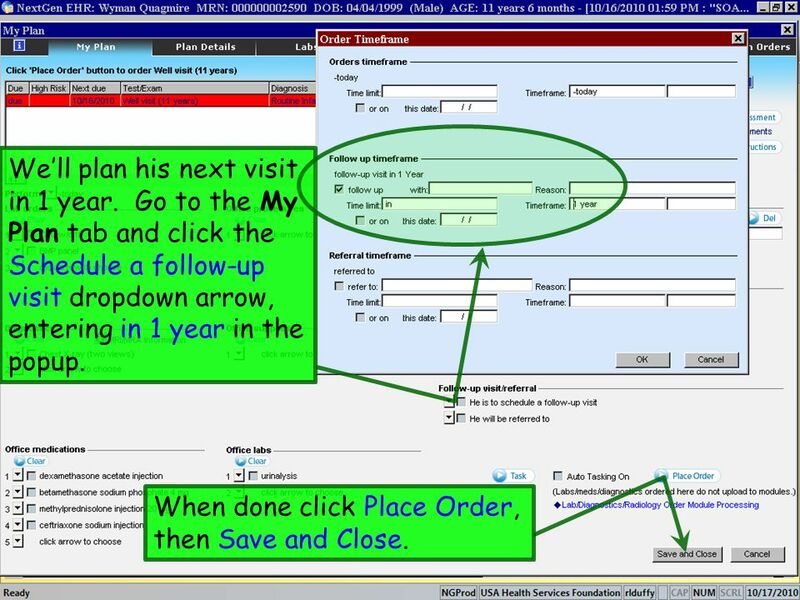 The 1st reason for visit already displays, since we specified that this was a Well Child visit type. Click in the 2nd Reasons for Visit box. 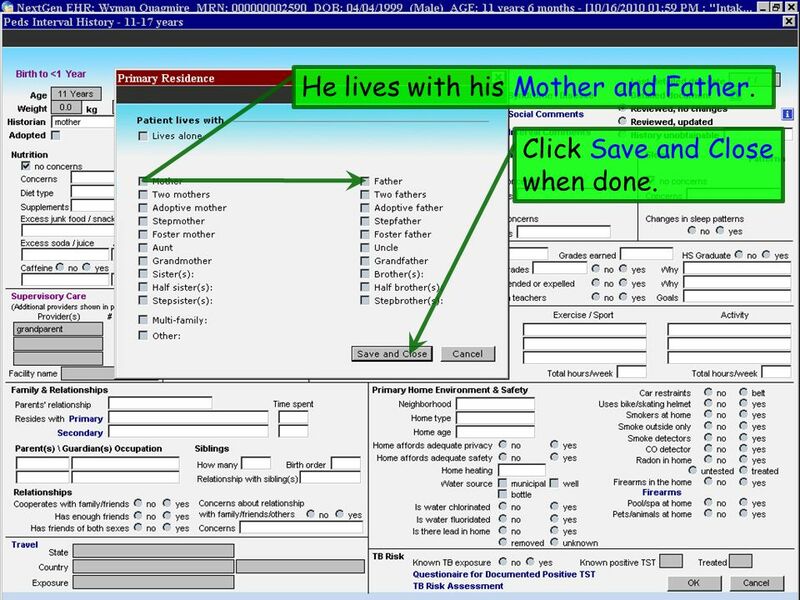 35 He also has an abrasion the mother would like checked, so in the popup click abrasion(s). 36 Abrasion has been added as a Reason for Visit. Note the Order Type box. 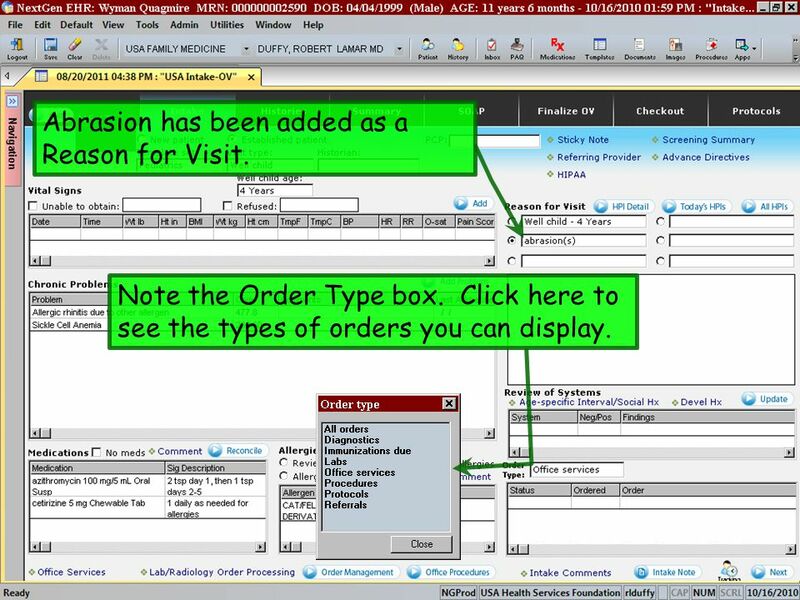 Click here to see the types of orders you can display. 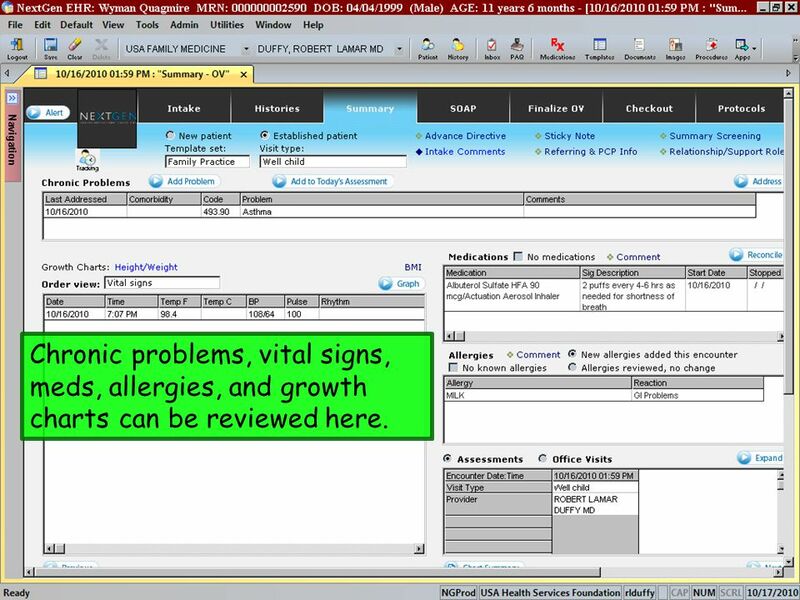 37 If you select Immunizations due, you’ll see a button to take you to the Immunizations template. 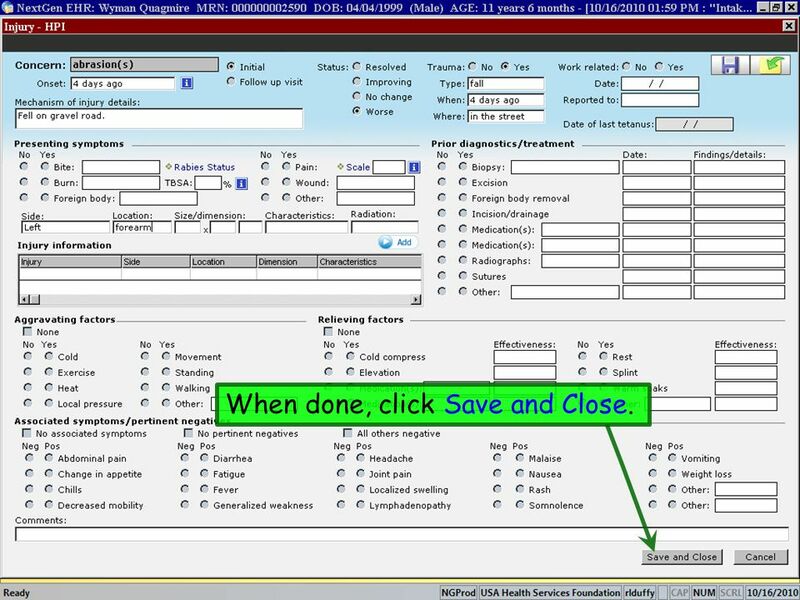 Unfortunately, for the near future, the Alabama ImmPrints vaccination registry is not being made available to interface with EHRs, so many clinics will continue to use it as their vaccination record. 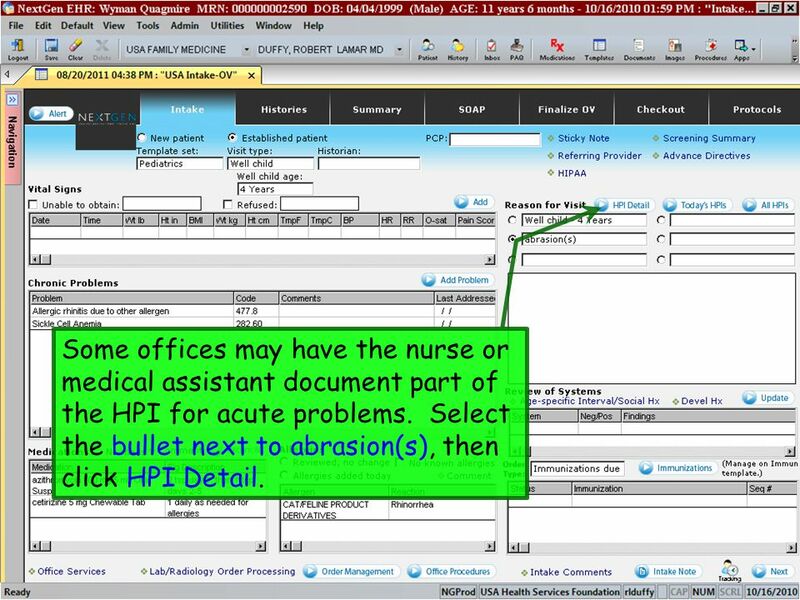 38 Some offices may have the nurse or medical assistant document part of the HPI for acute problems. 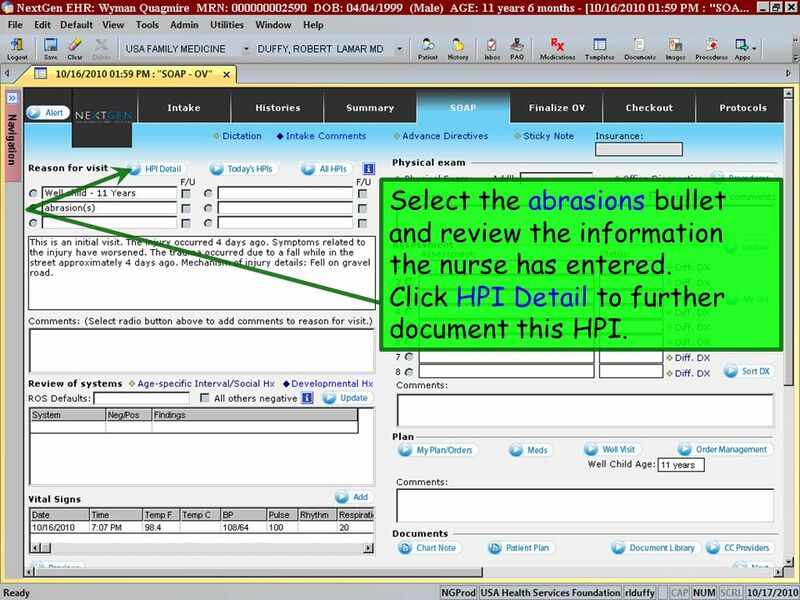 Select the bullet next to abrasion(s), then click HPI Detail. 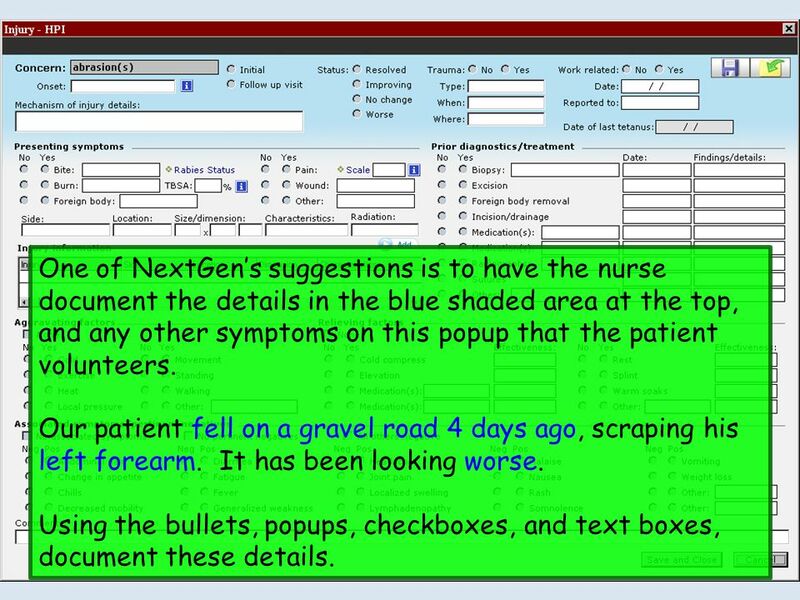 39 One of NextGen’s suggestions is to have the nurse document the details in the blue shaded area at the top, and any other symptoms on this popup that the patient volunteers. Our patient fell on a gravel road 4 days ago, scraping his left forearm. It has been looking worse. 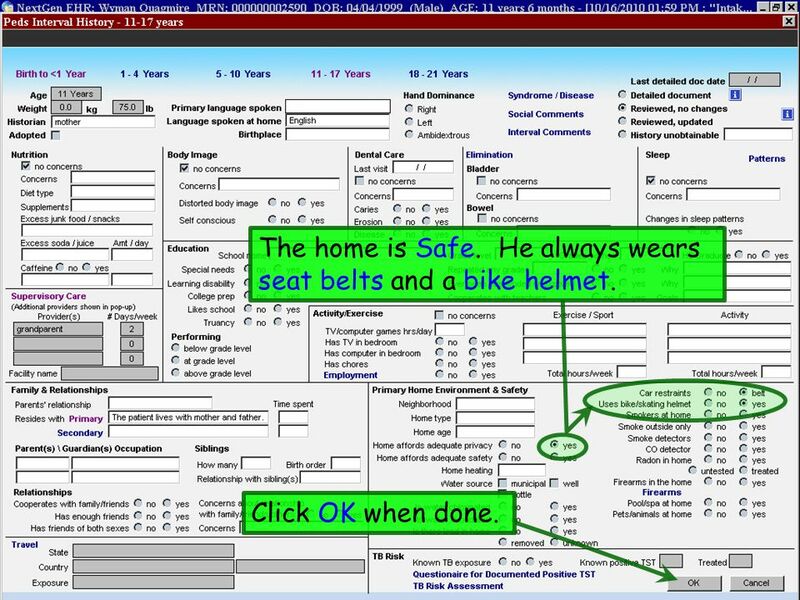 Using the bullets, popups, checkboxes, and text boxes, document these details. 40 When done, click Save and Close. 41 Several Review of Systems items can be entered here. 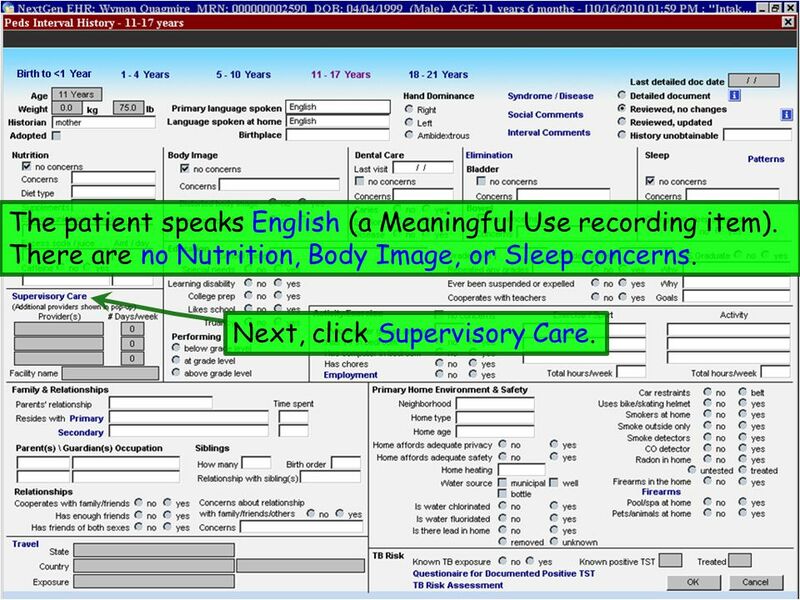 42 The patient speaks English (a Meaningful Use recording item). There are no Nutrition, Body Image, or Sleep concerns. 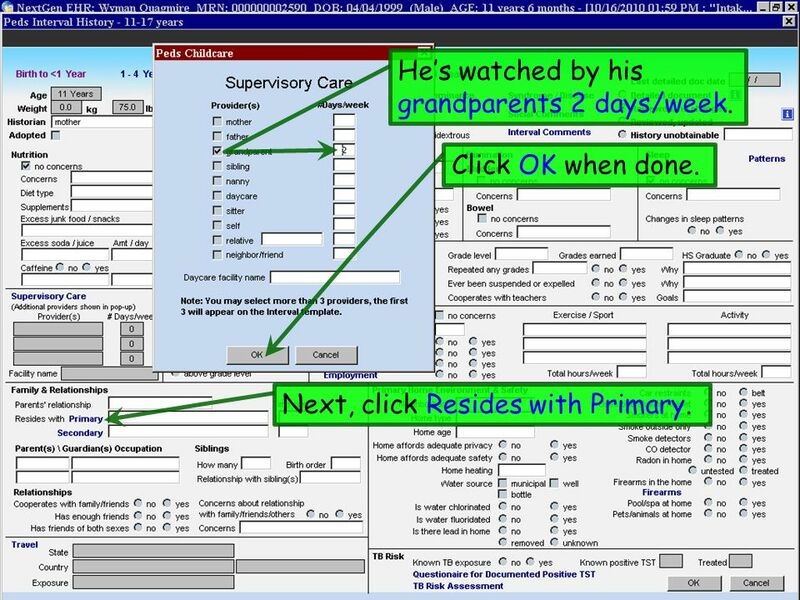 Next, click Supervisory Care. 43 He’s watched by his grandparents 2 days/week. Click OK when done. Next, click Resides with Primary. 44 He lives with his Mother and Father. 45 The home is Safe. He always wears seat belts and a bike helmet. 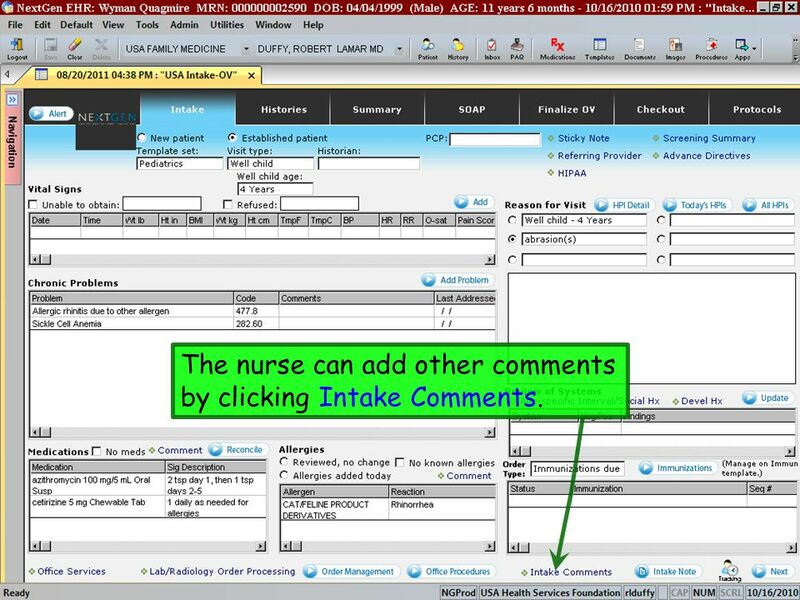 46 The nurse can add other comments by clicking Intake Comments. 47 Type comments as desired, then click Save and Close. 48 Now move to the Histories tab. 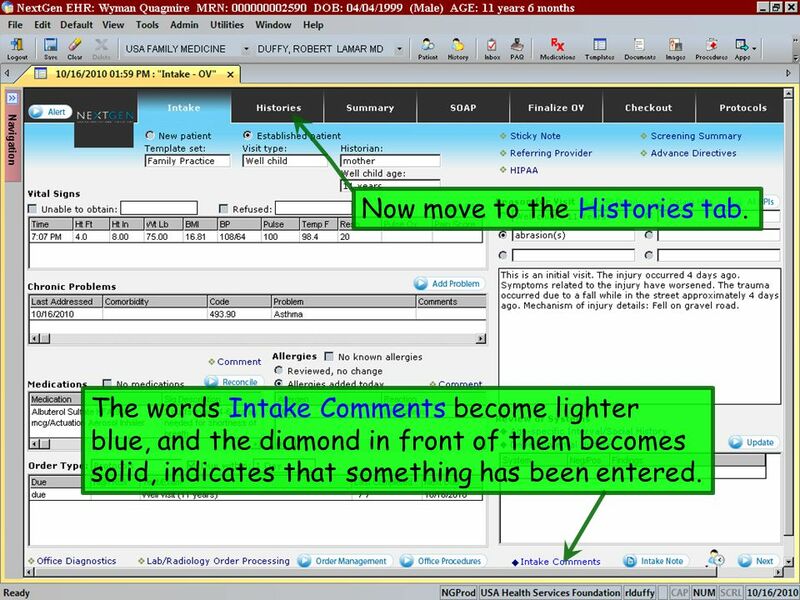 The words Intake Comments become lighter blue, and the diamond in front of them becomes solid, indicates that something has been entered. The nurse reviews/enters Past Medical/Surgical history. 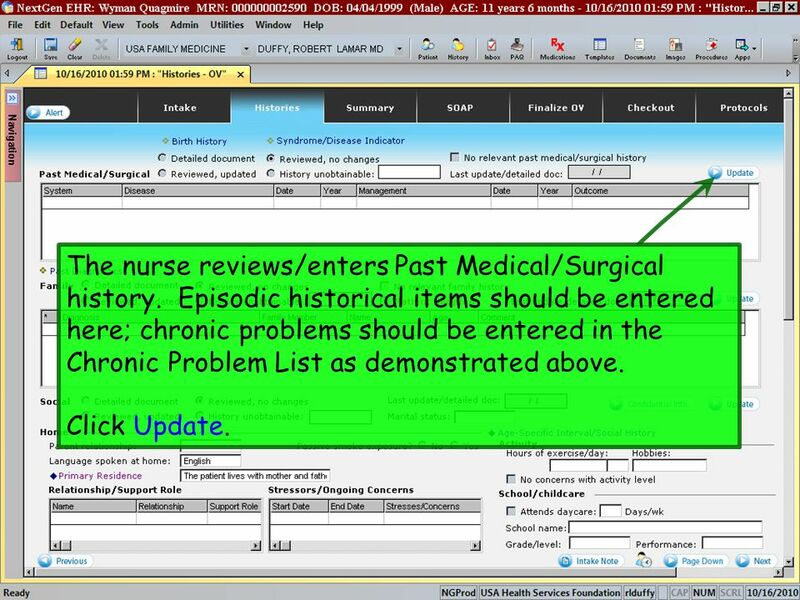 Episodic historical items should be entered here; chronic problems should be entered in the Chronic Problem List as demonstrated above. Click Update. 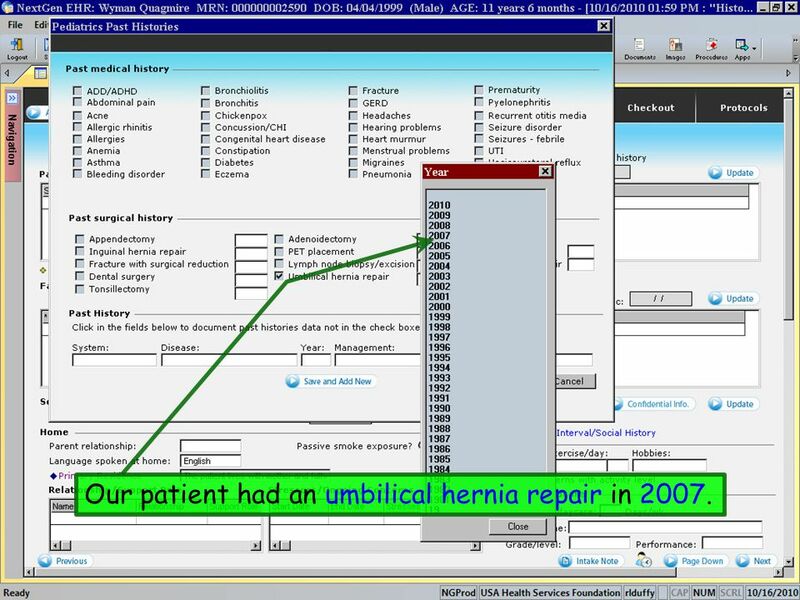 50 Our patient had an umbilical hernia repair in 2007. 51 If you have other items to add, click Save and Add New. When done, click Save and Close. The hernia repair shows on the grid. You could double-click on this item to add more details, but that’s not necessary in this case. 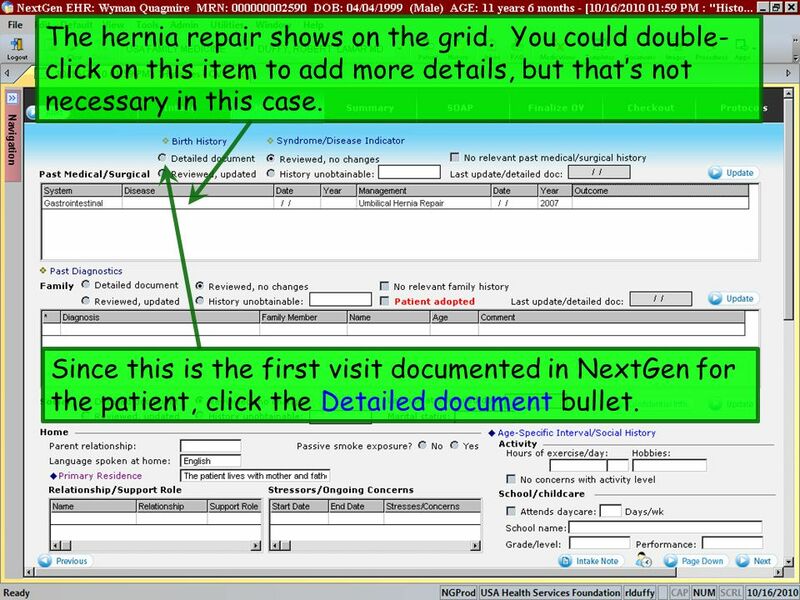 Since this is the first visit documented in NextGen for the patient, click the Detailed document bullet. 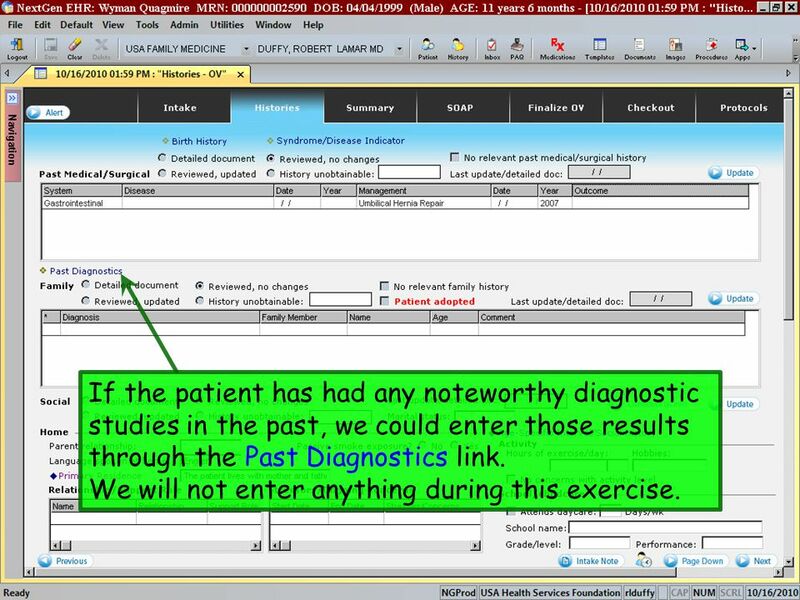 53 If the patient has had any noteworthy diagnostic studies in the past, we could enter those results through the Past Diagnostics link. We will not enter anything during this exercise. 54 To enter the Family History, click the Update button. 55 His mother is alive and well. 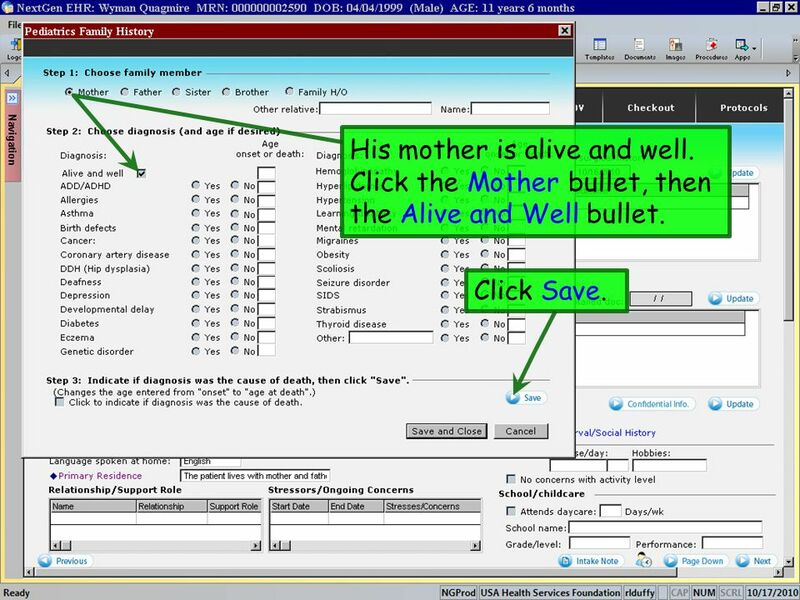 Click the Mother bullet, then the Alive and Well bullet. Click Save. 56 His father has coronary heart disease. 57 These additions display in the grid. 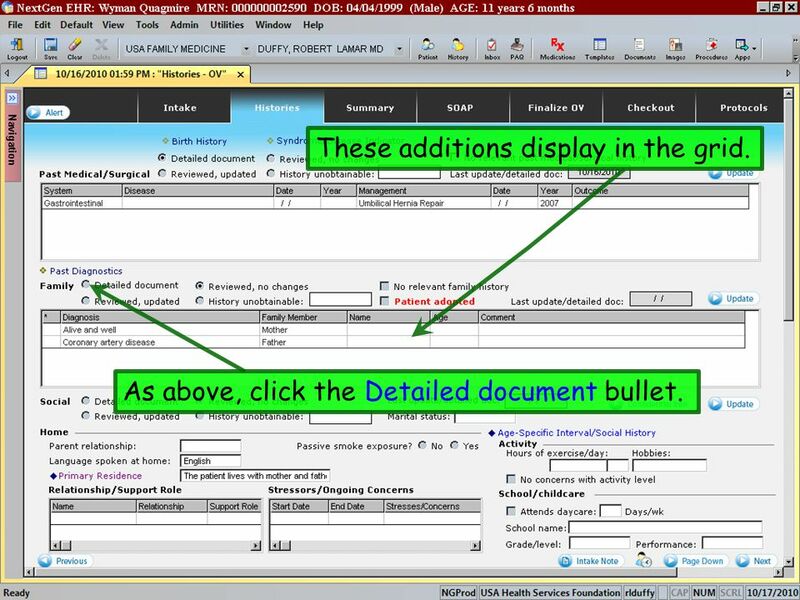 As above, click the Detailed document bullet. 58 Some Social history that was entered above displays. We’ll add that the parents are married. 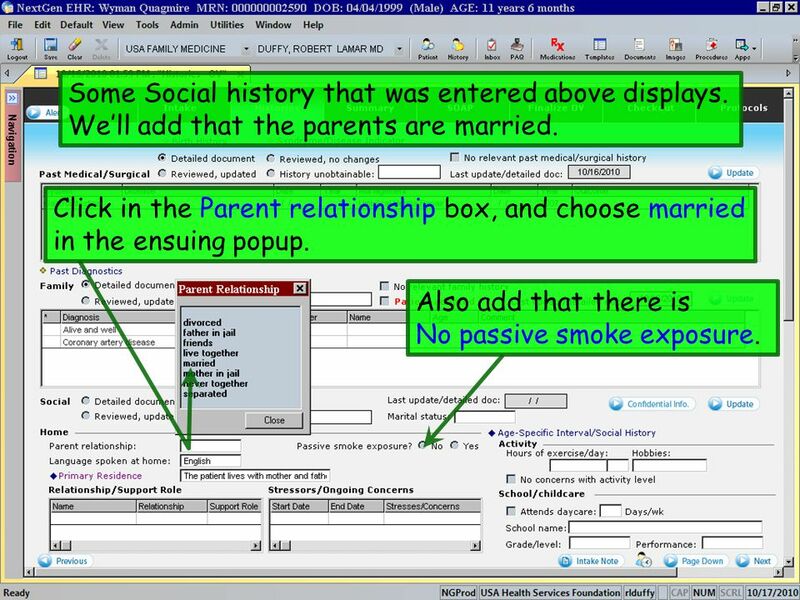 Click in the Parent relationship box, and choose married in the ensuing popup. Also add that there is No passive smoke exposure. 59 As above, click the Detailed document bullet. 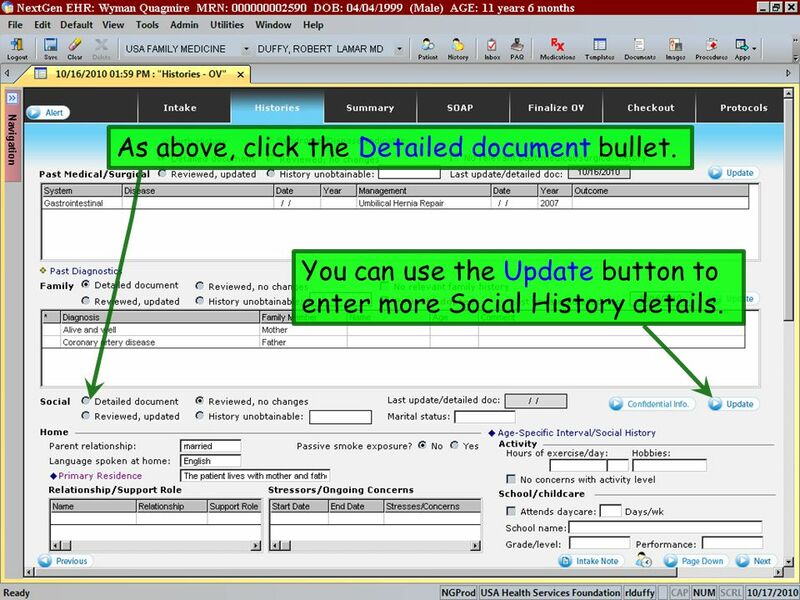 You can use the Update button to enter more Social History details. 60 We’ll add that they have Smoke detectors in the home. 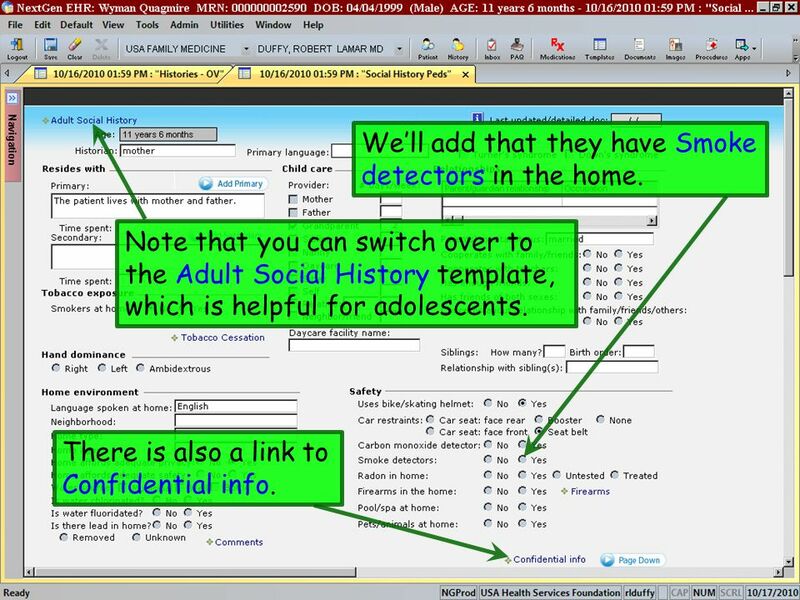 Note that you can switch over to the Adult Social History template, which is helpful for adolescents. There is also a link to Confidential info. 61 We have nothing to add here for this exercise, so click the X to close this template. Further Social History may be entered here. More items may be viewed if you scroll down. 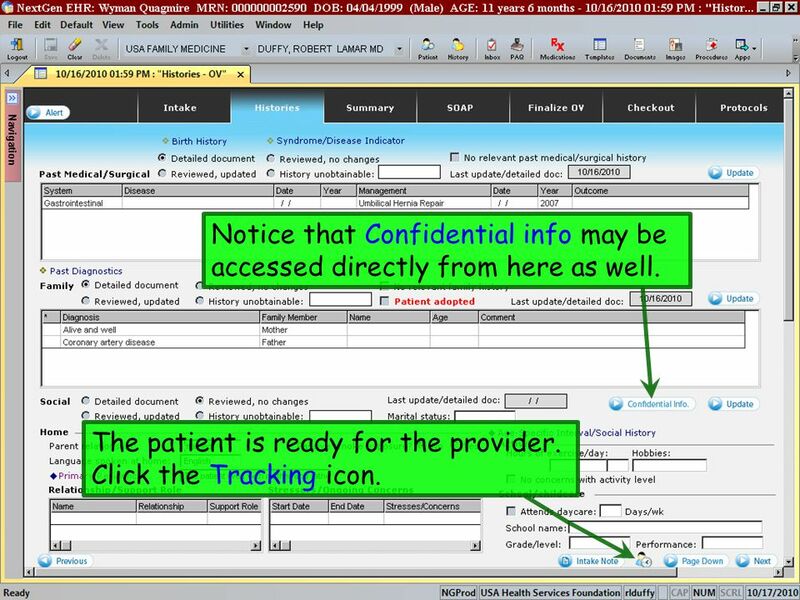 62 Notice that Confidential info may be accessed directly from here as well. The patient is ready for the provider. Click the Tracking icon. 63 In the Room box, enter Exam 2. In the Status box, enter waiting for provider. Click Save and Close. 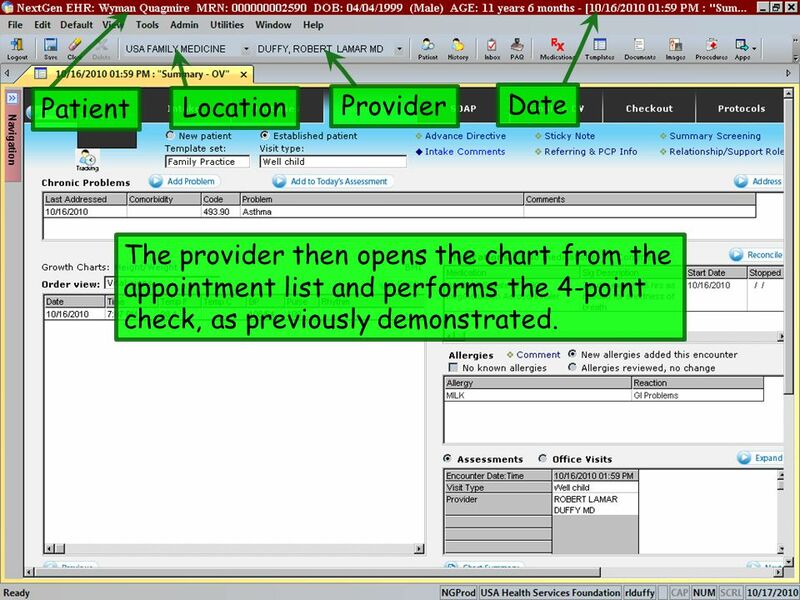 64 Patient Location Provider Date The provider then opens the chart from the appointment list and performs the 4-point check, as previously demonstrated. 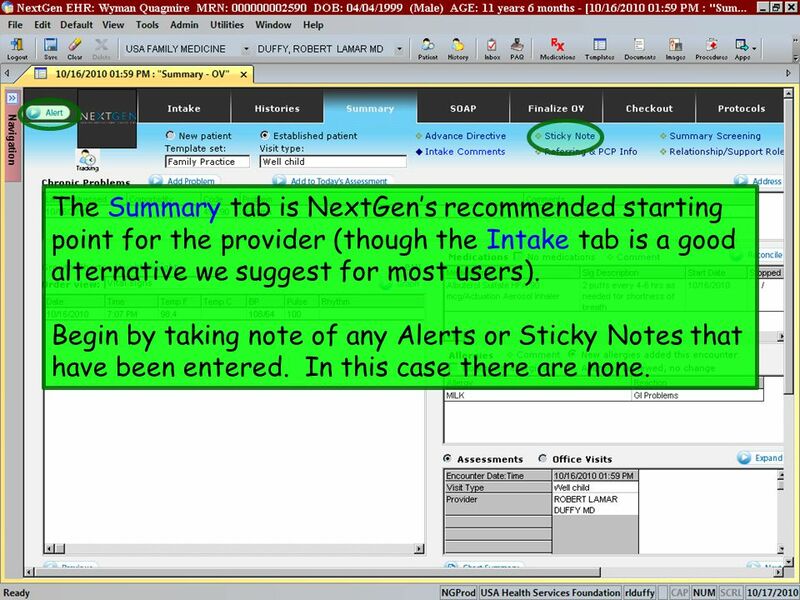 65 The Summary tab is NextGen’s recommended starting point for the provider (though the Intake tab is a good alternative we suggest for most users). 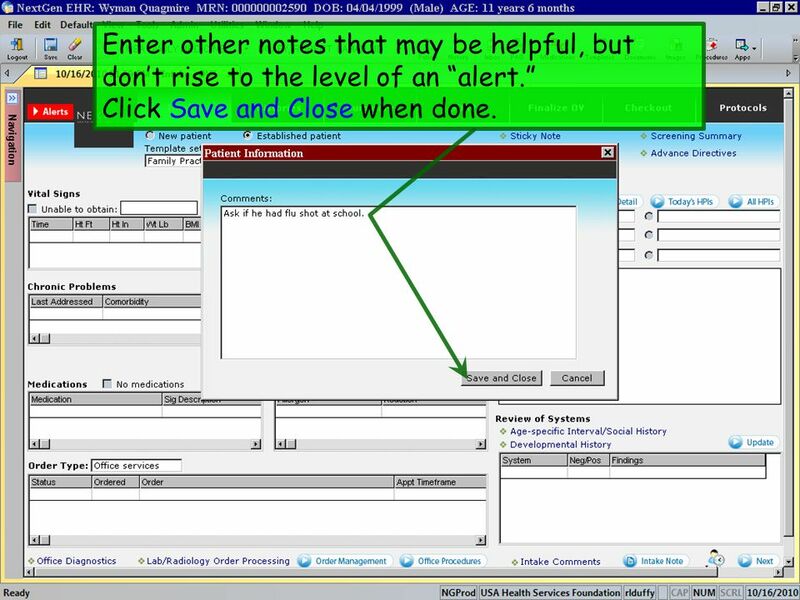 Begin by taking note of any Alerts or Sticky Notes that have been entered. In this case there are none. 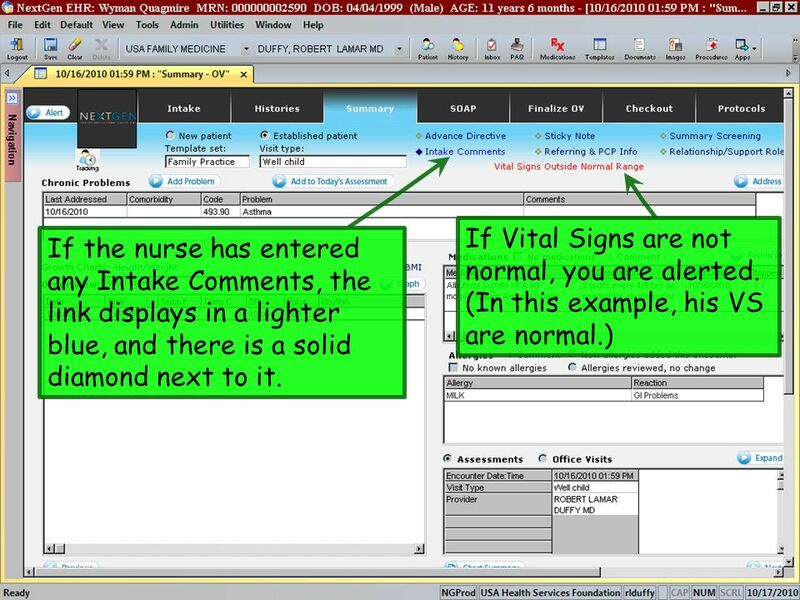 If Vital Signs are not normal, you are alerted. (In this example, his VS are normal.) 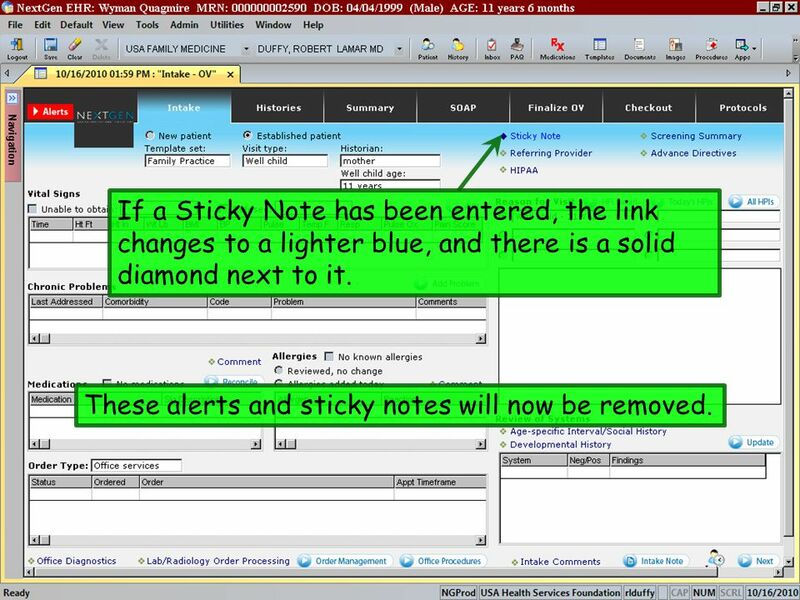 If the nurse has entered any Intake Comments, the link displays in a lighter blue, and there is a solid diamond next to it. 67 Chronic problems, vital signs, meds, allergies, and growth charts can be reviewed here. Click in the Order view box. 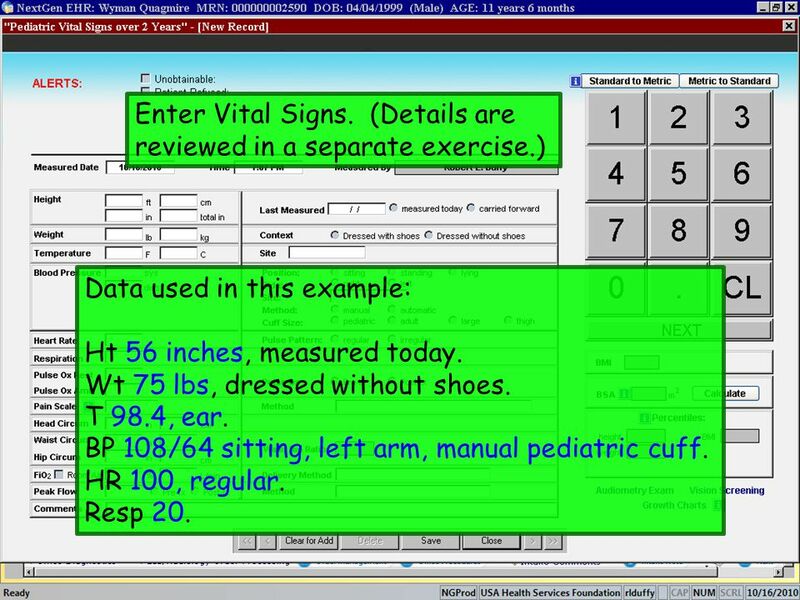 Note that while it initially displays vital signs, several other items can be displayed here. You will also want to review the Histories tab. 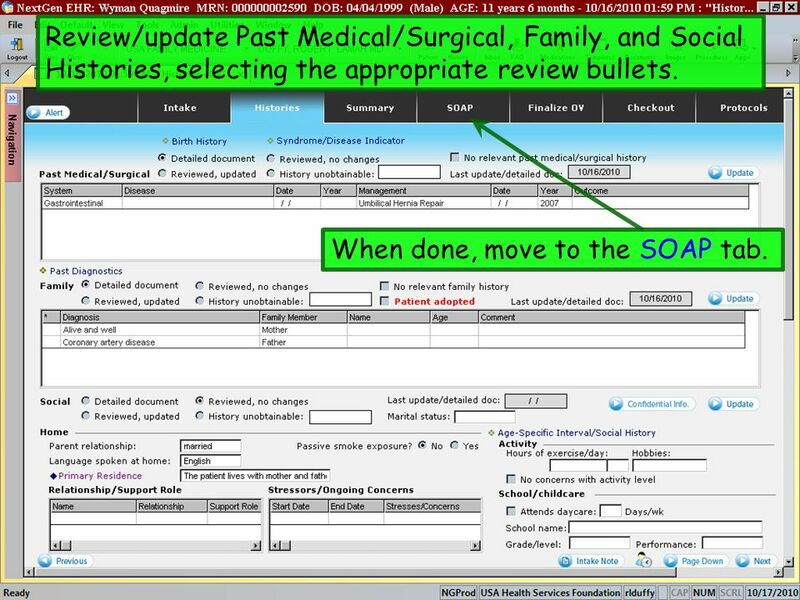 69 Review/update Past Medical/Surgical, Family, and Social Histories, selecting the appropriate review bullets. When done, move to the SOAP tab. 70 Review the Reasons for Visit. 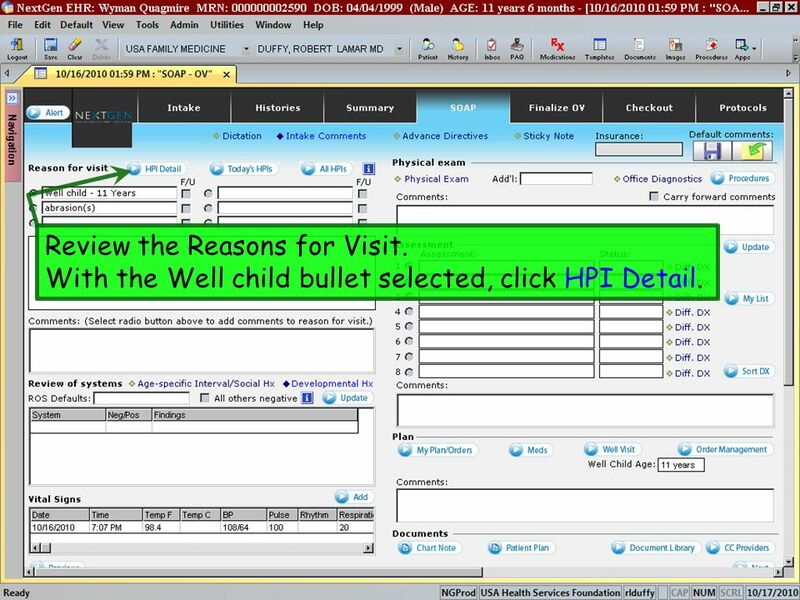 With the Well child bullet selected, click HPI Detail. 71 Actually, you don’t really need to document much here for a routine well child visit. 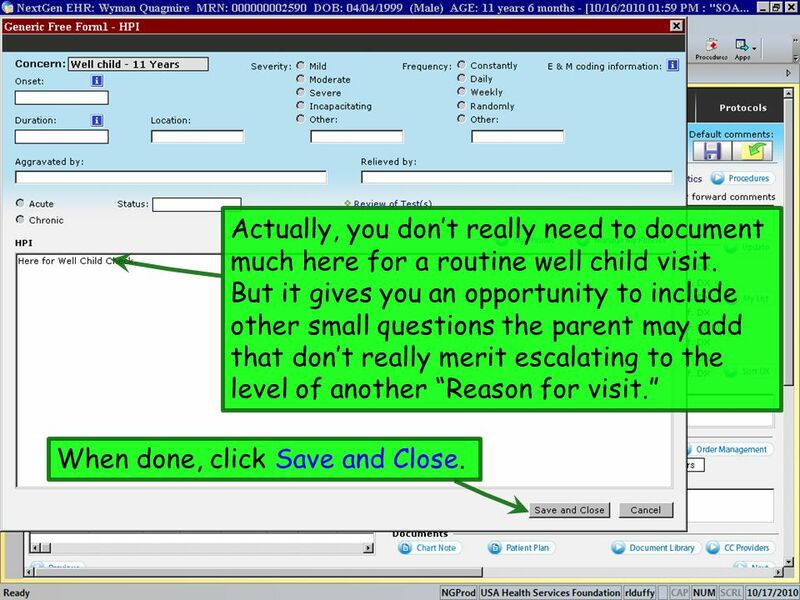 But it gives you an opportunity to include other small questions the parent may add that don’t really merit escalating to the level of another “Reason for visit.” When done, click Save and Close. 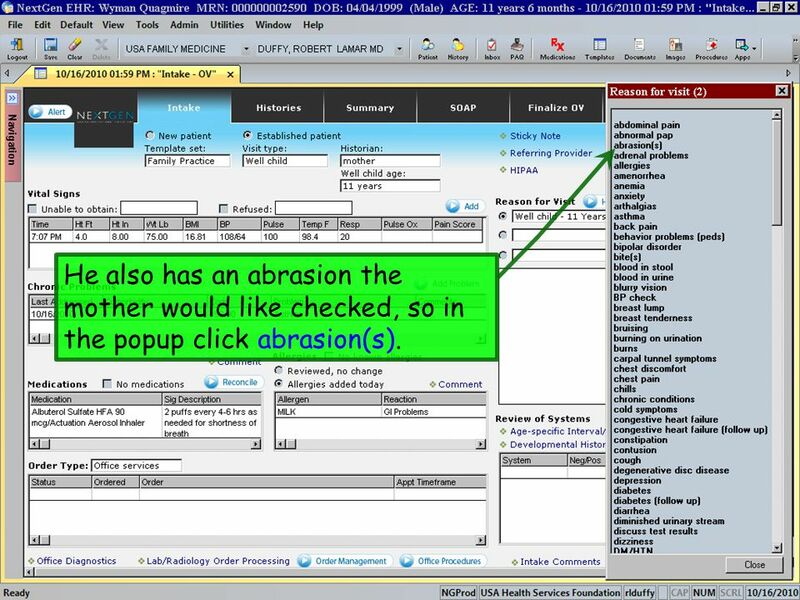 72 Select the abrasions bullet and review the information the nurse has entered. 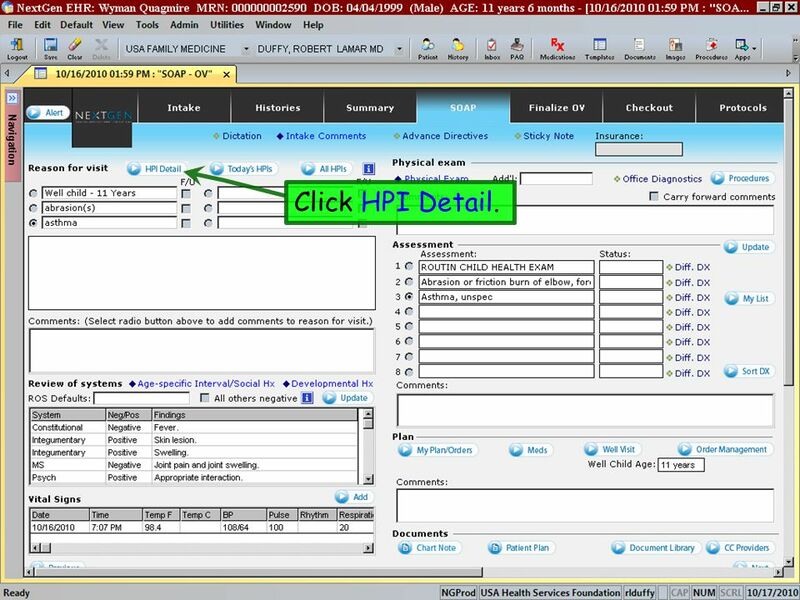 Click HPI Detail to further document this HPI. Add that there are no aggravating or relieving factors. Under Associated symptoms/pertinent negatives, indicate his Localized swelling. When done, click Save and Close. 75 These details display. 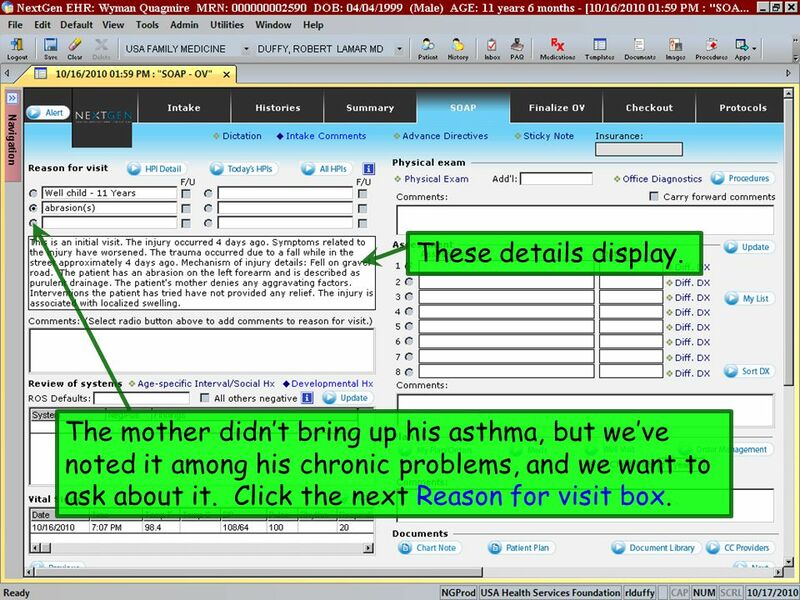 The mother didn’t bring up his asthma, but we’ve noted it among his chronic problems, and we want to ask about it. Click the next Reason for visit box. 78 Upon questioning, the mother and patient reveal that his symptoms are only mild, occasional, without recent changes. He has no smoke exposure. His symptoms can be aggravated by animal dander and pollen, but are relieved by albuterol. 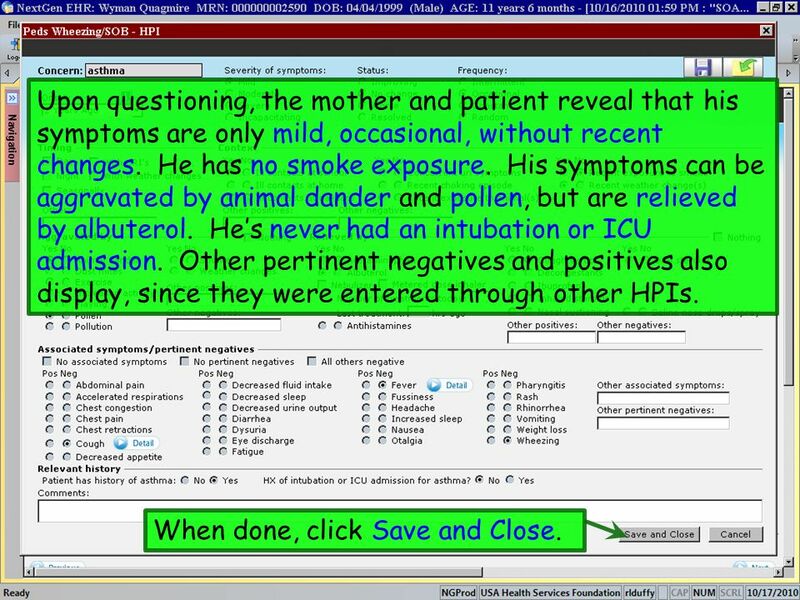 He’s never had an intubation or ICU admission. Other pertinent negatives and positives also display, since they were entered through other HPIs. When done, click Save and Close. 79 These details display. 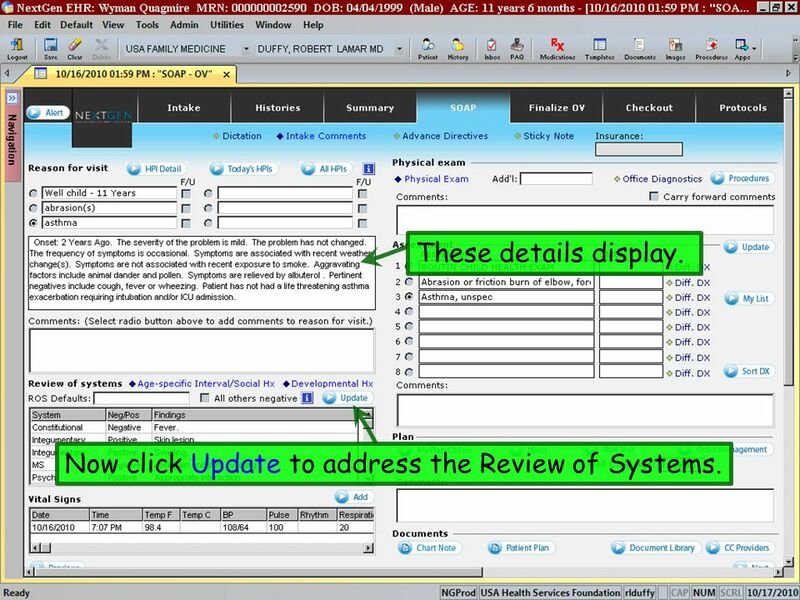 Now click Update to address the Review of Systems. 80 Some items that have been previously entered through the HPI may appear here. Add other items as per your normal practice and as dictated by the visit. 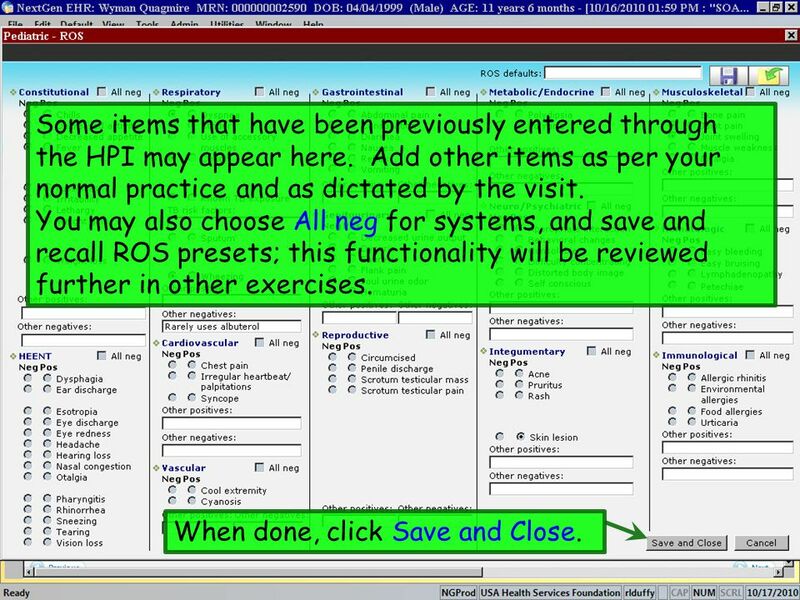 You may also choose All neg for systems, and save and recall ROS presets; this functionality will be reviewed further in other exercises. When done, click Save and Close. 81 Next, click Physical Exam. 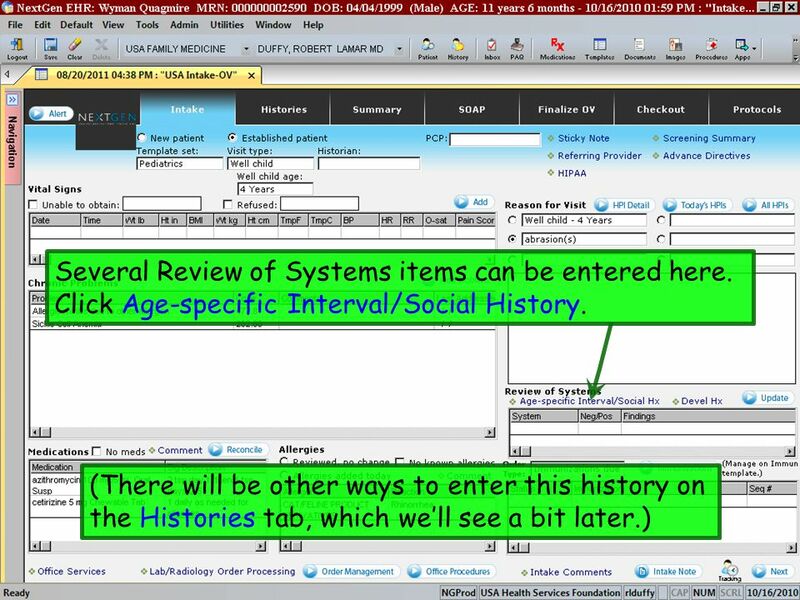 Though you may have reviewed these details earlier on the Histories tab, you can view the Interval/Social Hx and Developmental Hx popups from here as well. The ROS details display. 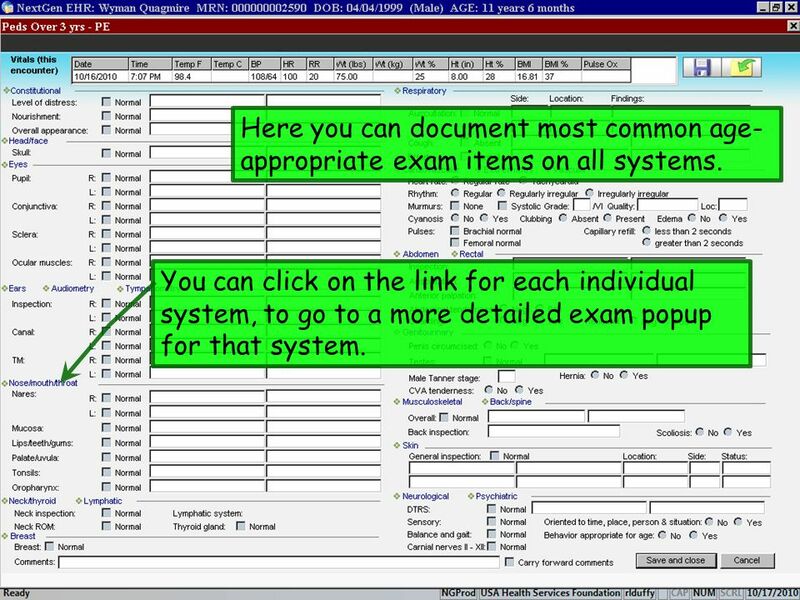 82 Here you can document most common age-appropriate exam items on all systems. 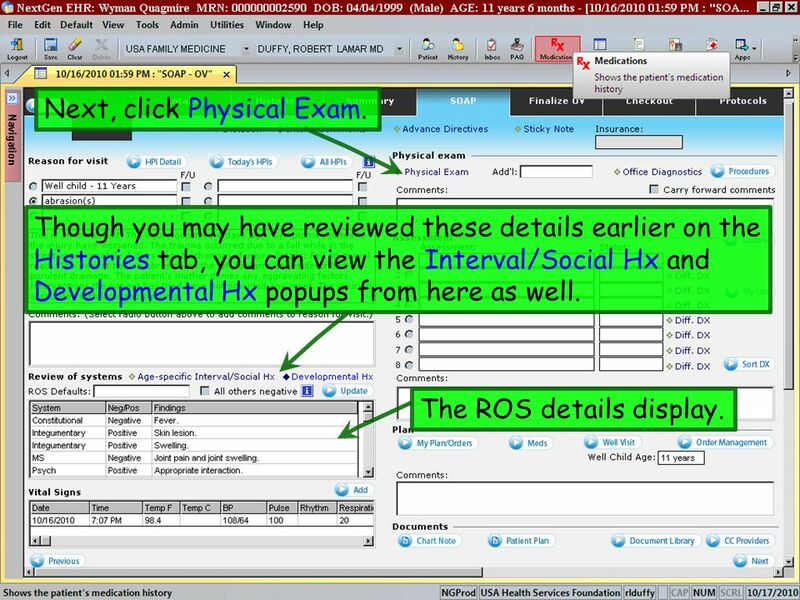 You can click on the link for each individual system, to go to a more detailed exam popup for that system. 83 Here we’ve documented several exam findings. 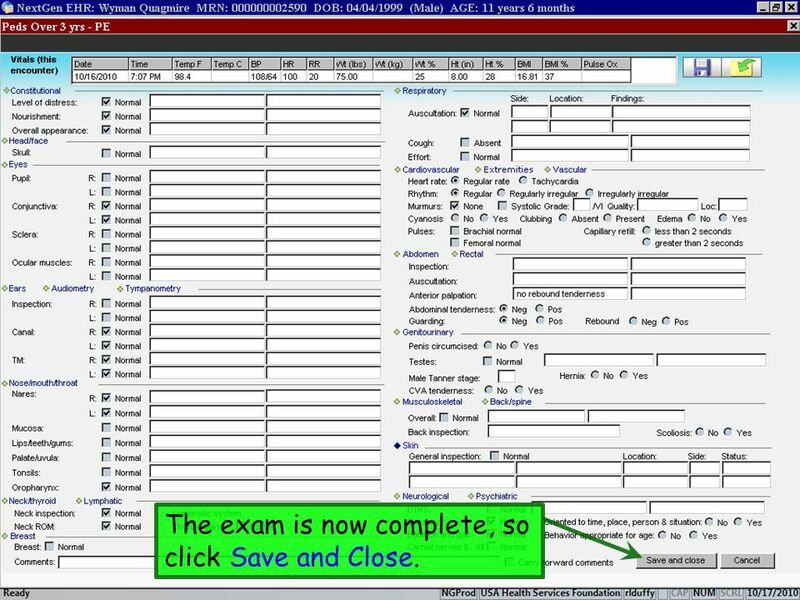 You can also save and recall personalized exam presets, which can save you time on future encounters. (A review of this is included in another lesson.) We need to document his abrasion. You can do this here for many simple items, but let’s click Skin to go to the Skin popup. 84 Here we’ve documented a 3 cm healing abrasion on his left forearm, with some serous drainage. 85 The exam is now complete, so click Save and Close. 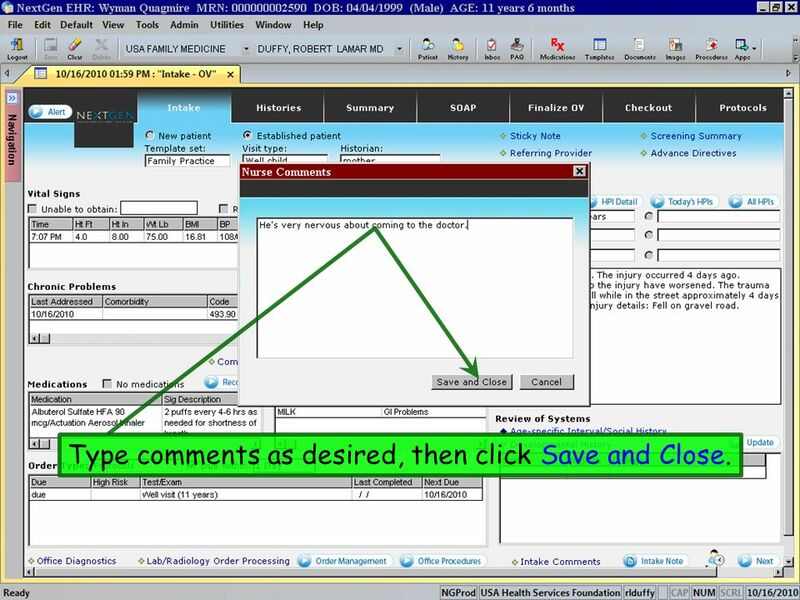 86 You can add exam comments here; you can also have them carry forward to the next visit. You can document procedures using this button; we will not be performing any procedures during this encounter. 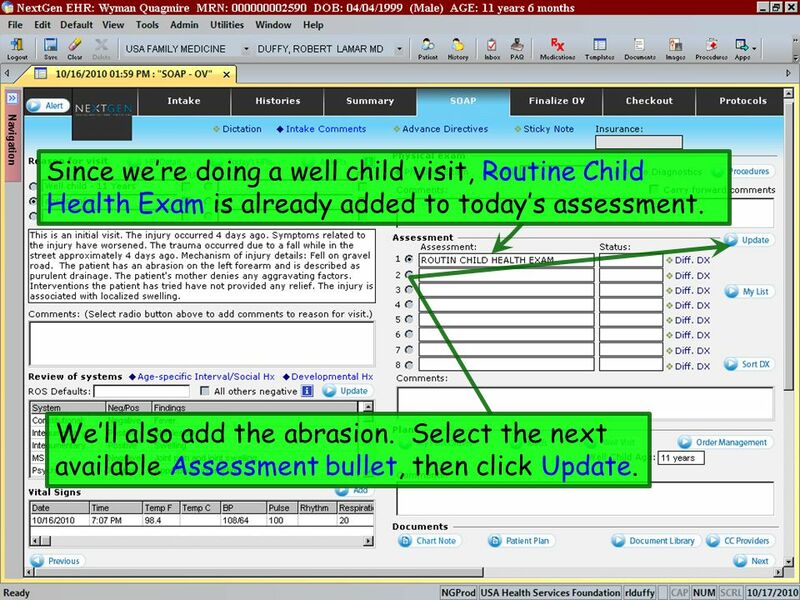 87 Since we’re doing a well child visit, Routine Child Health Exam is already added to today’s assessment. We’ll also add the abrasion. Select the next available Assessment bullet, then click Update. 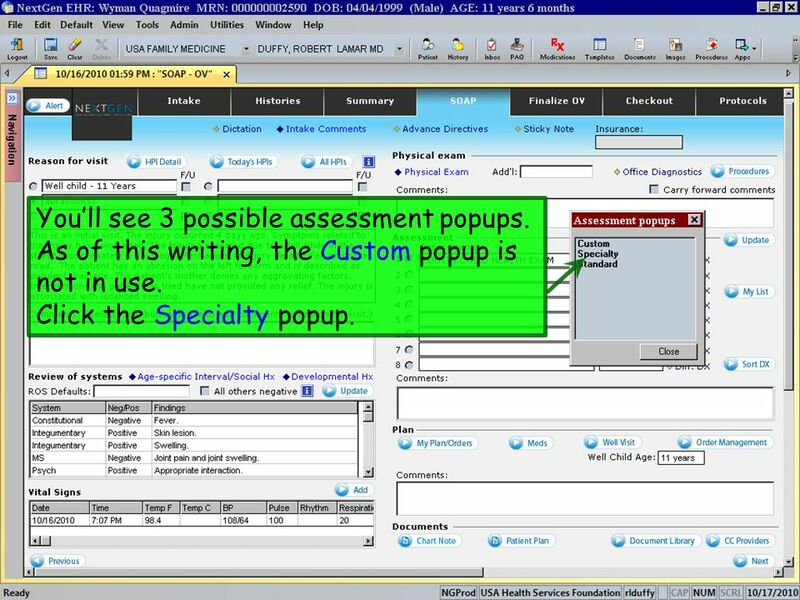 88 You’ll see 3 possible assessment popups. As of this writing, the Custom popup is not in use. Click the Specialty popup. This leads to a list of common specialty-specific diagnoses. 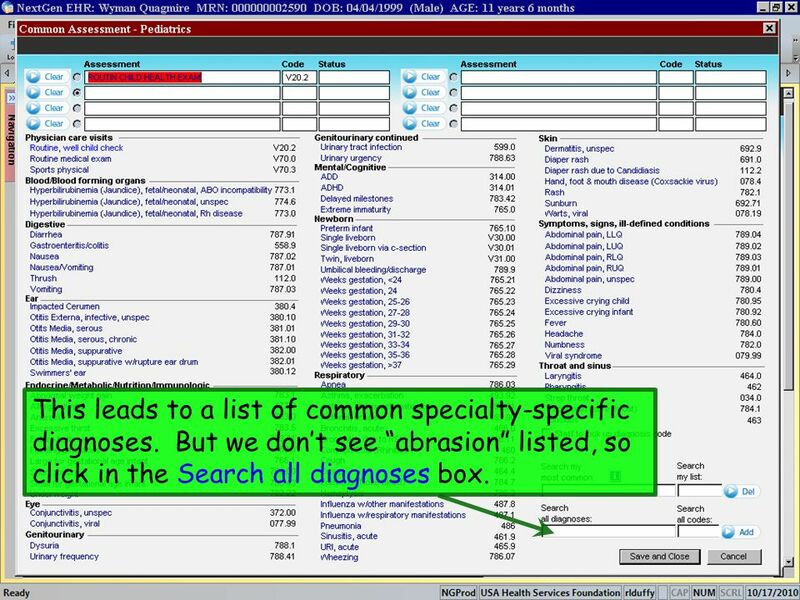 But we don’t see “abrasion” listed, so click in the Search all diagnoses box. 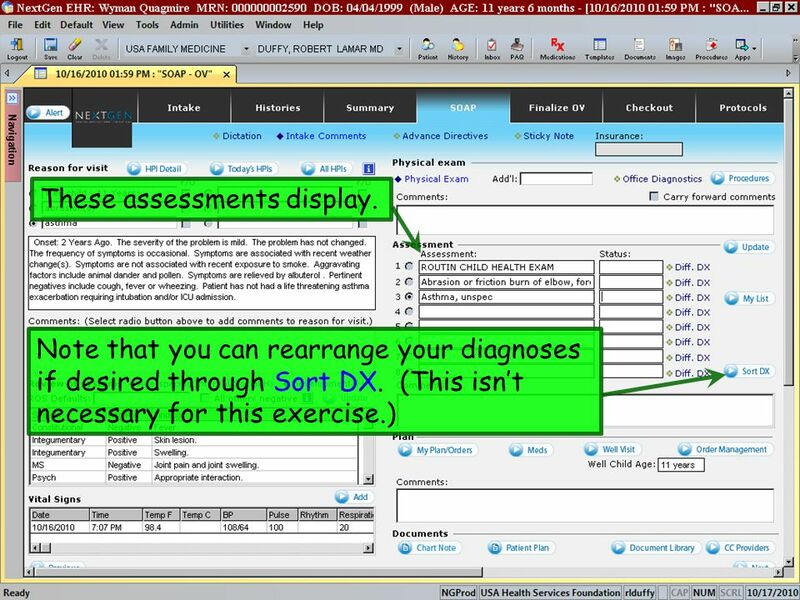 90 The familiar diagnosis search box appears. 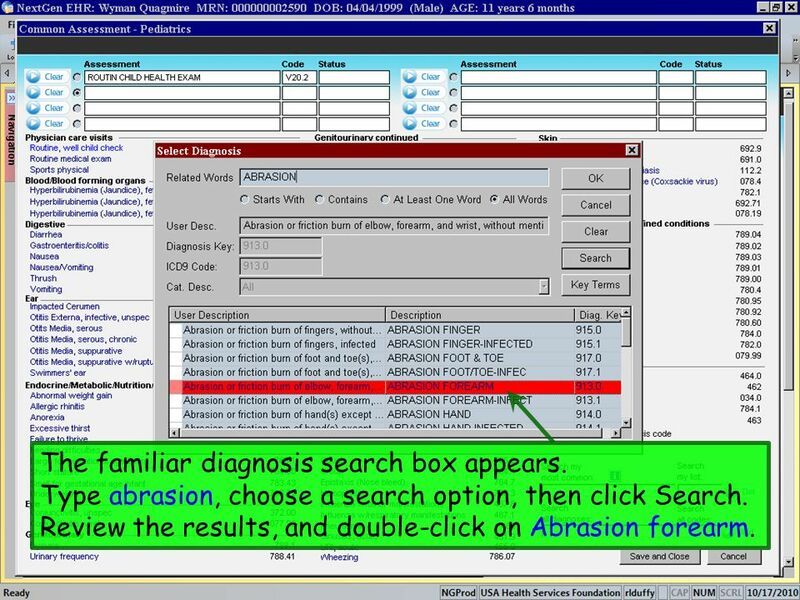 Type abrasion, choose a search option, then click Search. 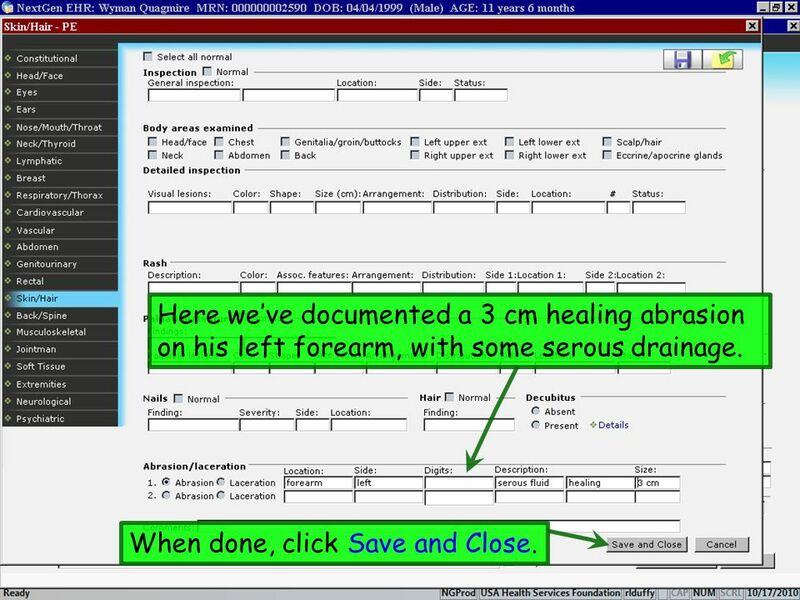 Review the results, and double-click on Abrasion forearm. 91 We also want to add his asthma. Click Asthma, unspec. When done, click Save and Close. Now we’ll enter some plans and orders. 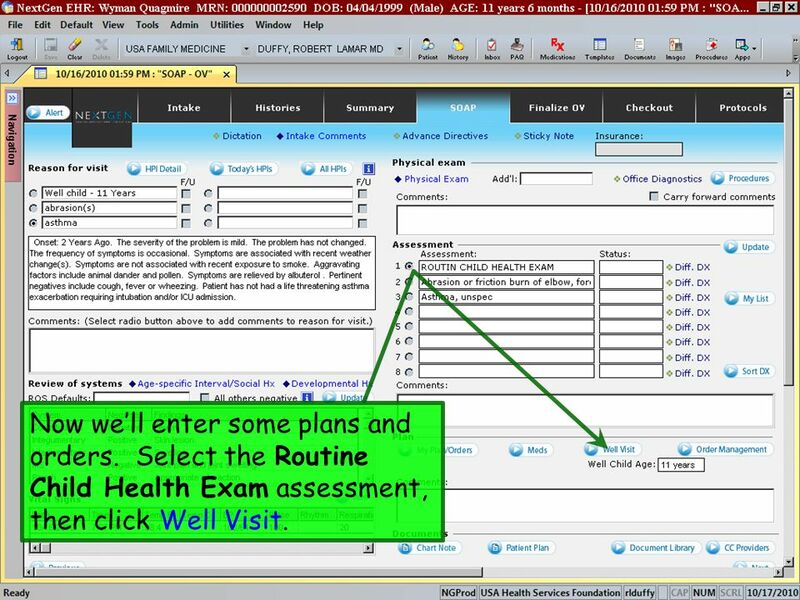 Select the Routine Child Health Exam assessment, then click Well Visit. A popup with age-appropriate orders and anticipatory guidance appears. The Vision screen and Audiometry have already been done. Add the other items that you discuss. 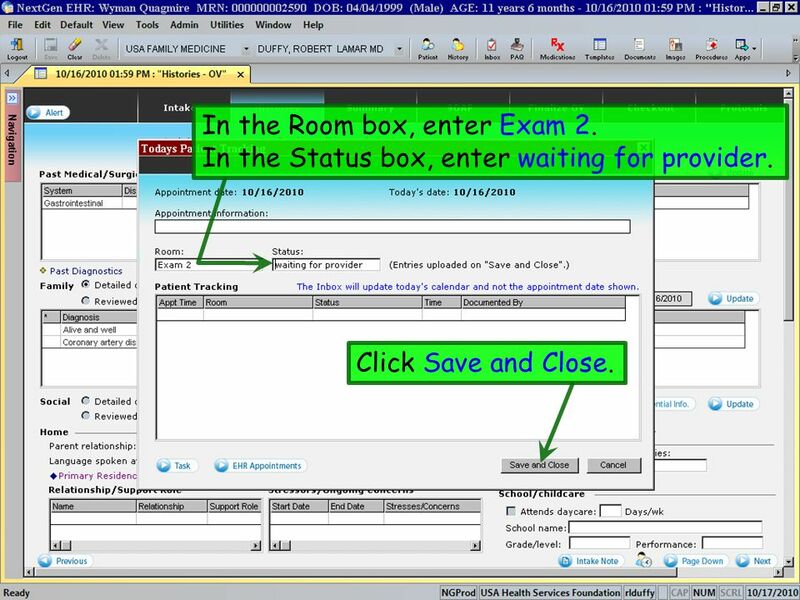 Immunization ordering and completion may be done in several different ways, depending on clinic policies. 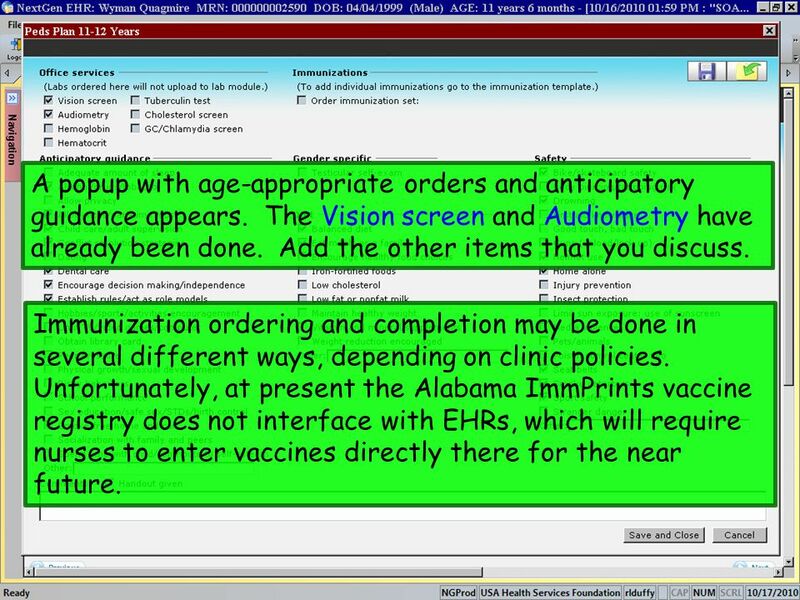 Unfortunately, at present the Alabama ImmPrints vaccine registry does not interface with EHRs, which will require nurses to enter vaccines directly there for the near future. 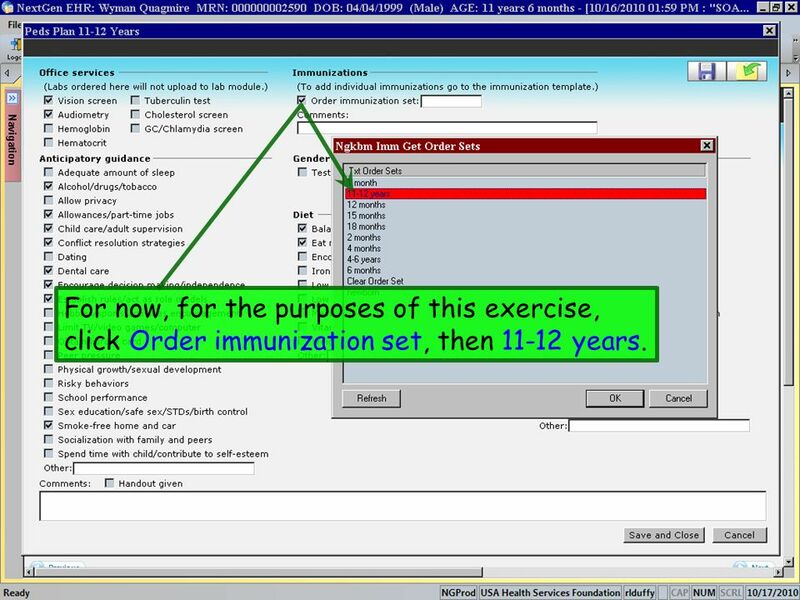 95 For now, for the purposes of this exercise, click Order immunization set, then 11-12 years. 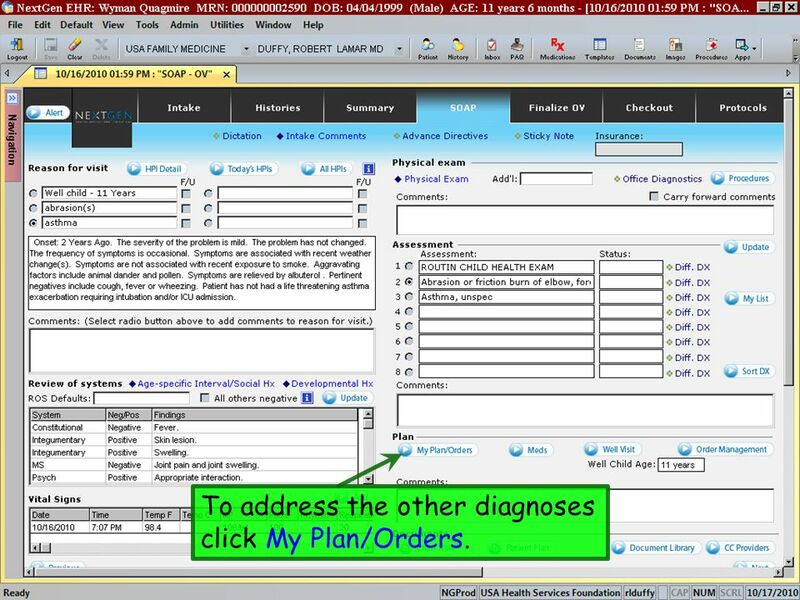 97 To address the other diagnoses click My Plan/Orders. 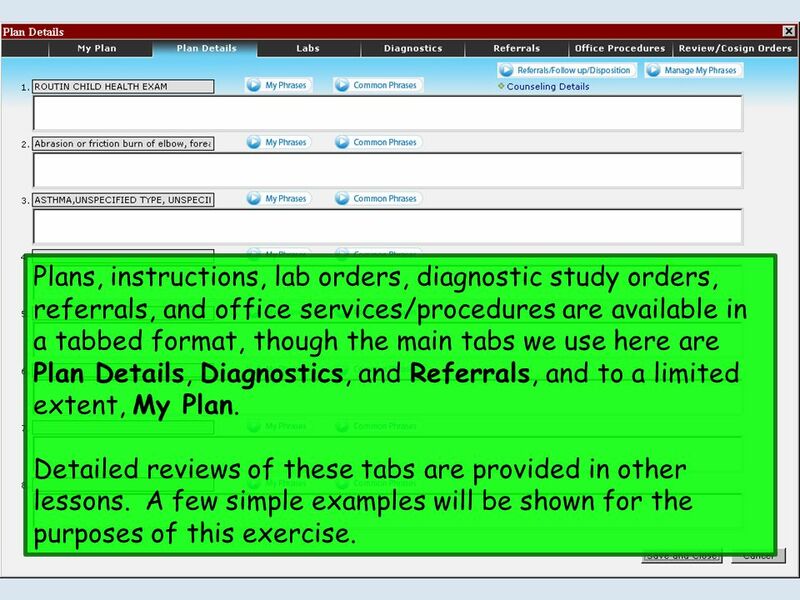 98 Plans, instructions, lab orders, diagnostic study orders, referrals, and office services/procedures are available in a tabbed format, though the main tabs we use here are Plan Details, Diagnostics, and Referrals, and to a limited extent, My Plan. Detailed reviews of these tabs are provided in other lessons. A few simple examples will be shown for the purposes of this exercise. 99 On the Plan Details tab, type some instructions for the abrasion and his asthma. 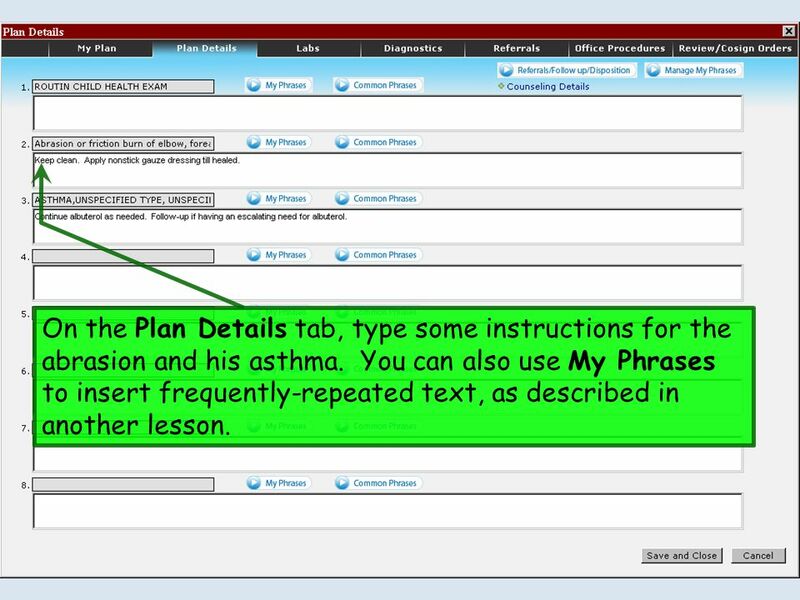 You can also use My Phrases to insert frequently-repeated text, as described in another lesson. We’ll plan his next visit in 1 year. 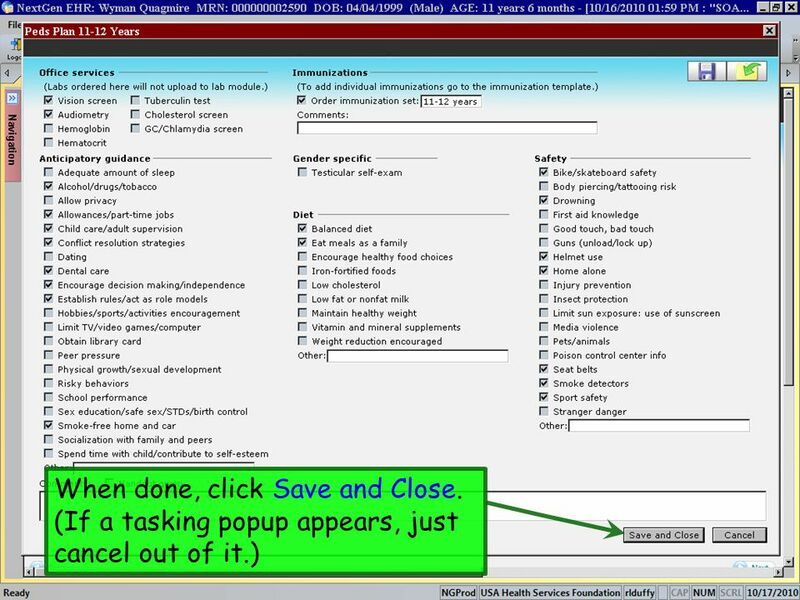 Go to the My Plan tab and click the Schedule a follow-up visit dropdown arrow, entering in 1 year in the popup. When done click Place Order, then Save and Close. 101 His albuterol inhaler is out of date, so he needs a refill. Click Meds. 102 When done, close the Medication Module. A detailed review of the Medication Module is provided in another exercise. 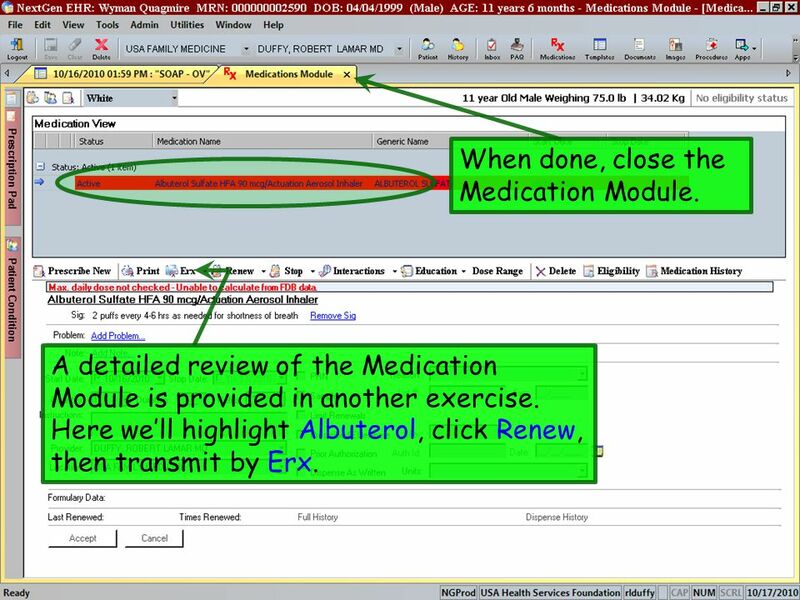 Here we’ll highlight Albuterol, click Renew, then transmit by Erx. 103 The patient needs a school excuse. 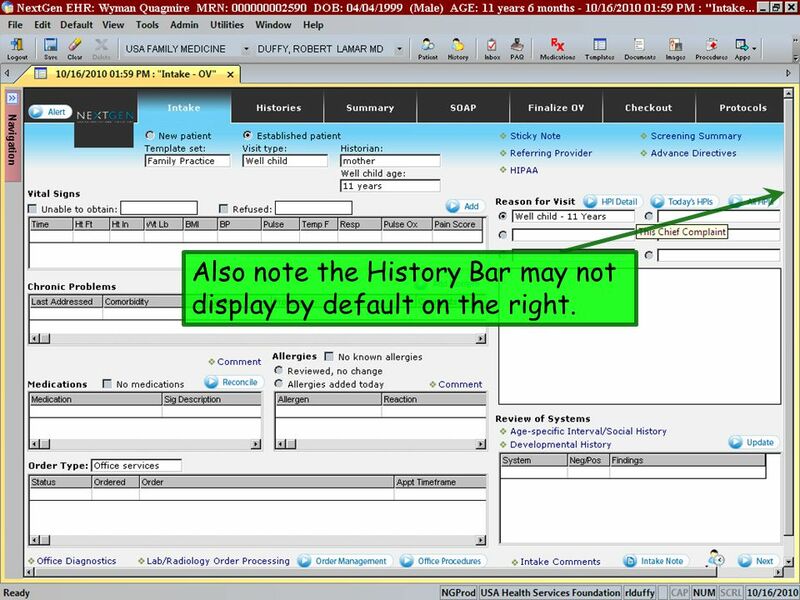 Display the History Bar if necessary and click on the Document Module. This opens a search window. Type Ex, and you’ll scroll forward and see ExcuseNote. Double-click on that. A basic excuse note appears. Edit as necessary and print. 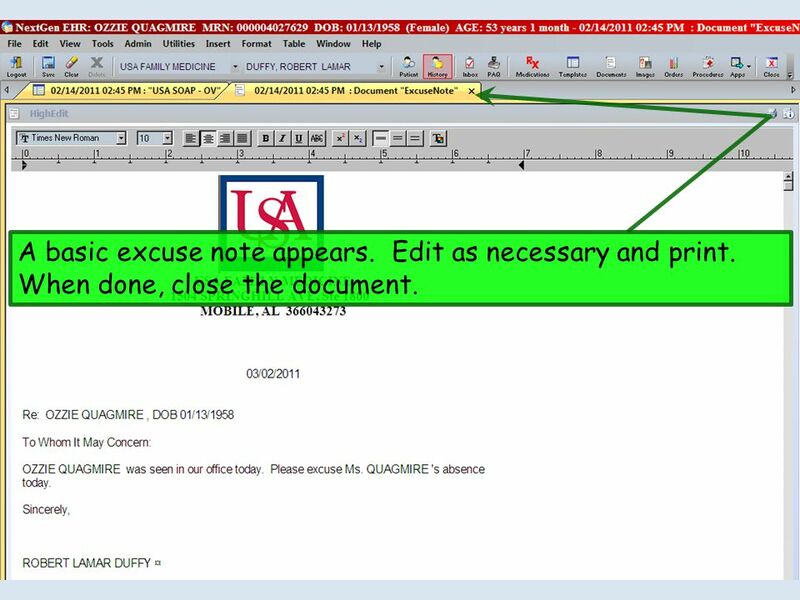 When done, close the document. You can also use this to create a letter. Start to type let…, and the display will scroll to this screen. 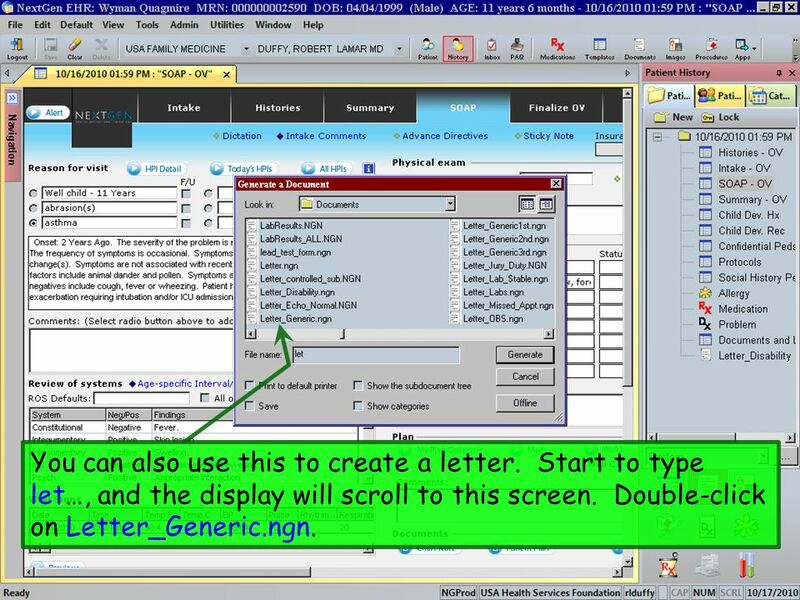 Double-click on Letter_Generic.ngn. 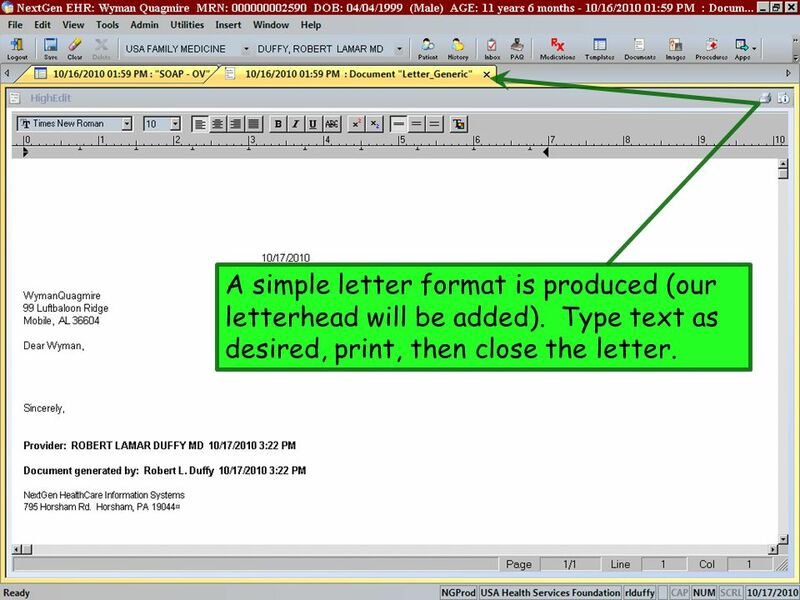 A simple letter format is produced (our letterhead will be added). Type text as desired, print, then close the letter. 108 Now generate today’s visit note. One way to do this would be to click Chart Note. 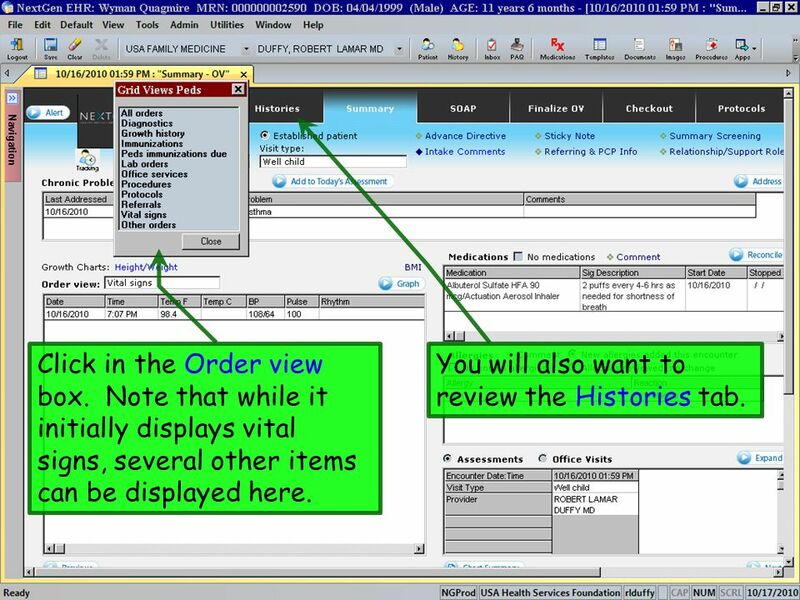 109 Your visit note displays. 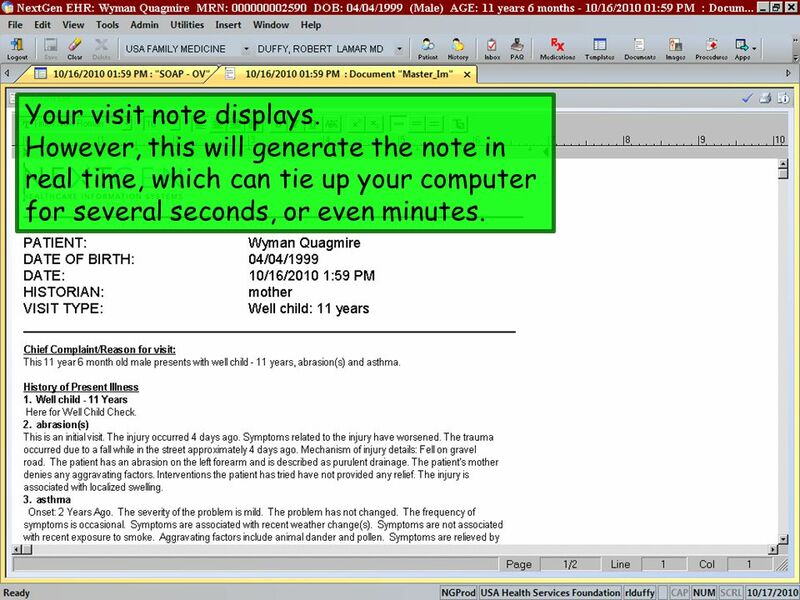 However, this will generate the note in real time, which can tie up your computer for several seconds, or even minutes. 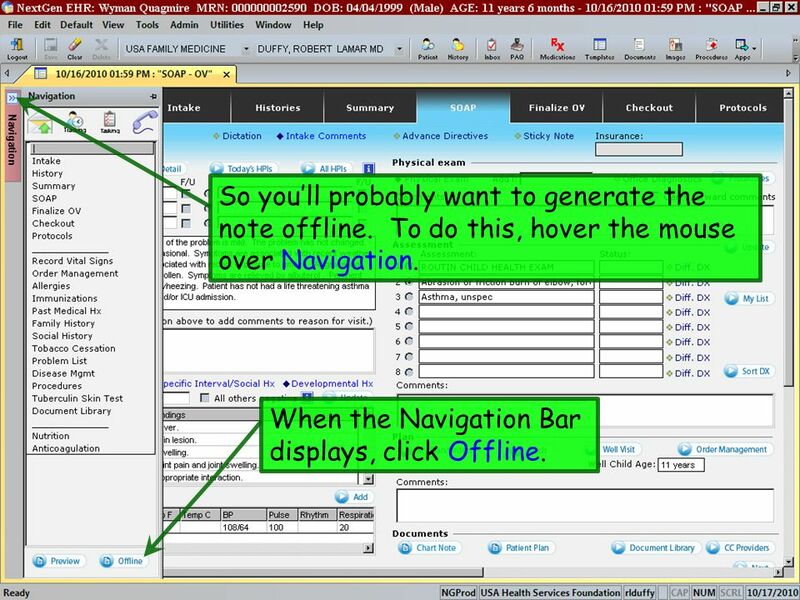 So you’ll probably want to generate the note offline. To do this, hover the mouse over Navigation. When the Navigation Bar displays, click Offline. 111 Now move to the Finalize OV tab. 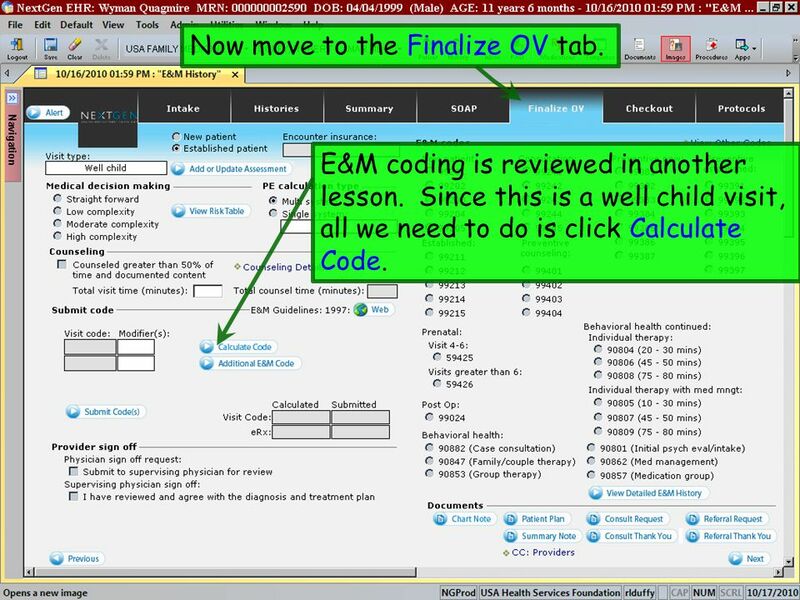 E&M coding is reviewed in another lesson. 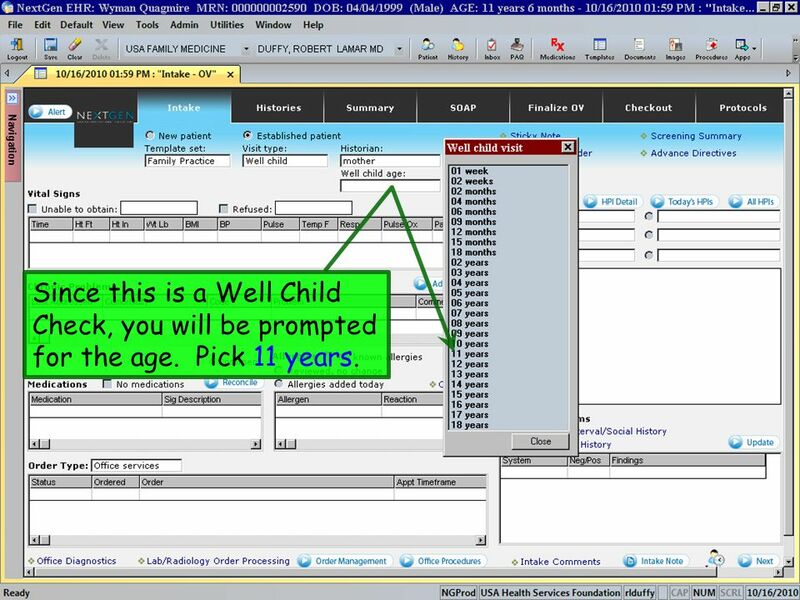 Since this is a well child visit, all we need to do is click Calculate Code. 112 If the calculated code is acceptable to you, click Submit Code(s). 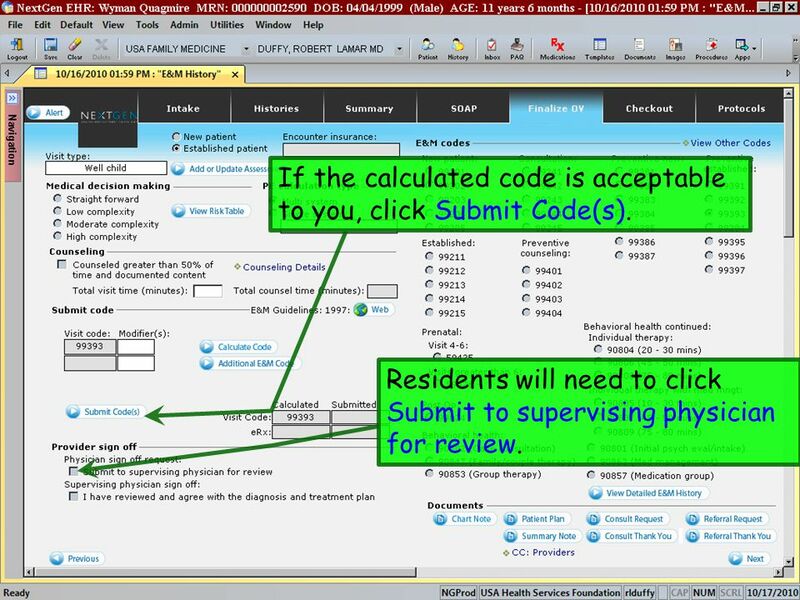 Residents will need to click Submit to supervising physician for review. 113 Select your attending, then click Add User(s). 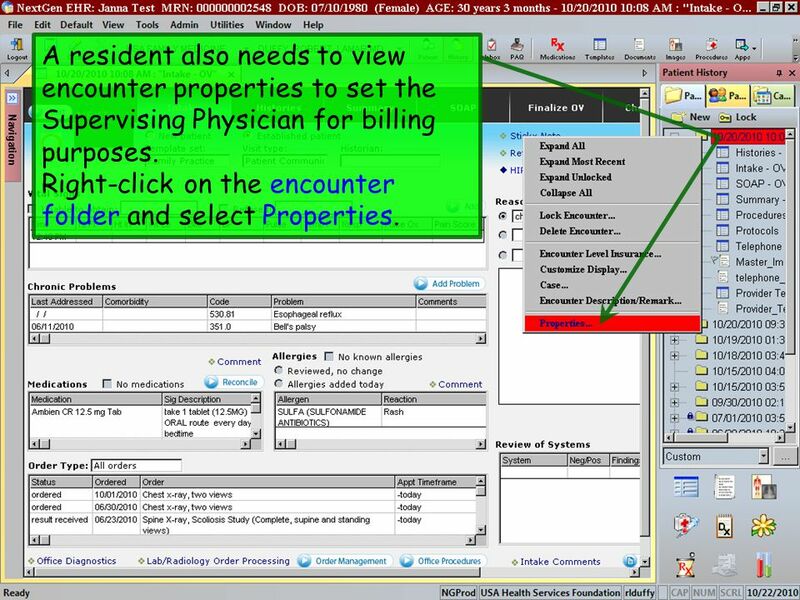 114 A resident also needs to view encounter properties to set the Supervising Physician for billing purposes. 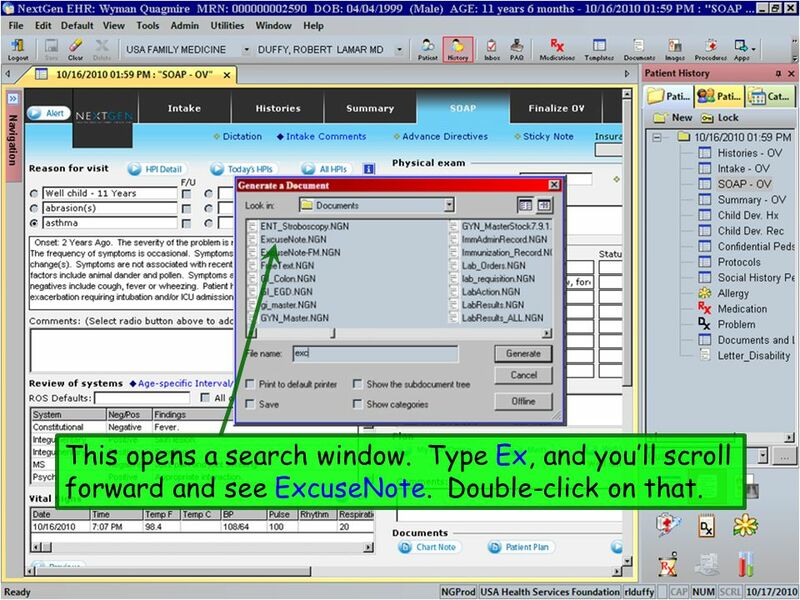 Right-click on the encounter folder and select Properties. 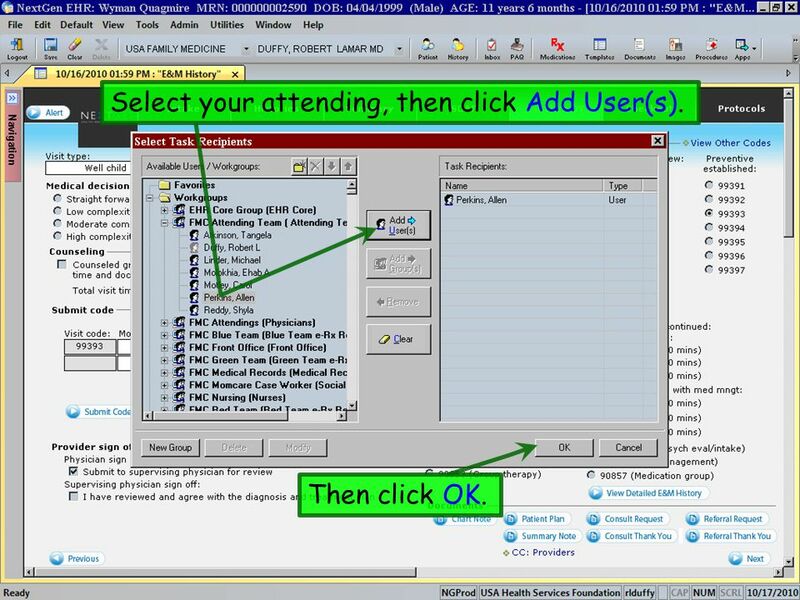 115 The resident doctor clicks the Supervisor dropdown arrow, and selects the attending. 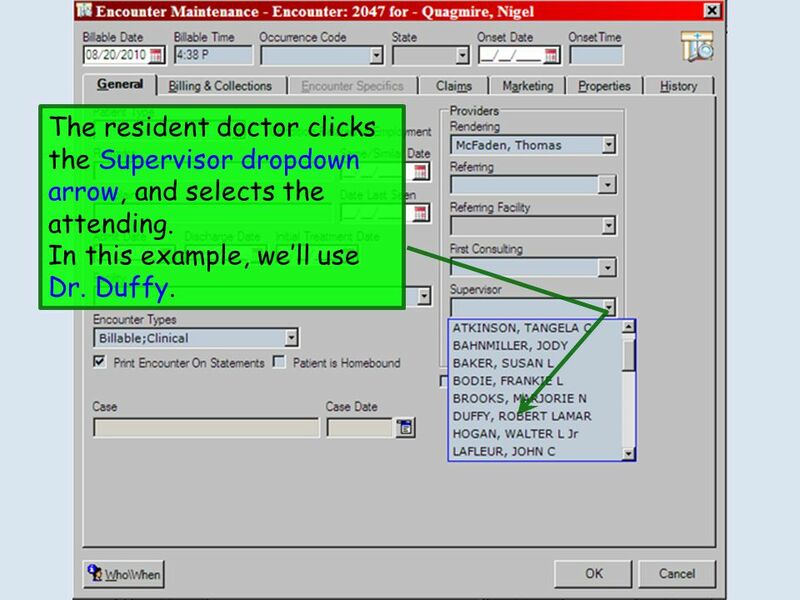 In this example, we’ll use Dr. Duffy. 116 Click OK to close the popup. 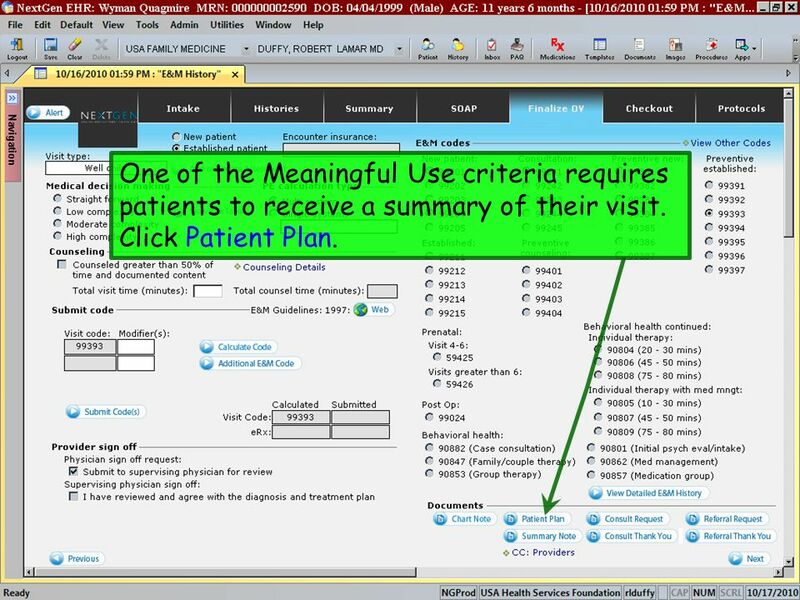 117 One of the Meaningful Use criteria requires patients to receive a summary of their visit. 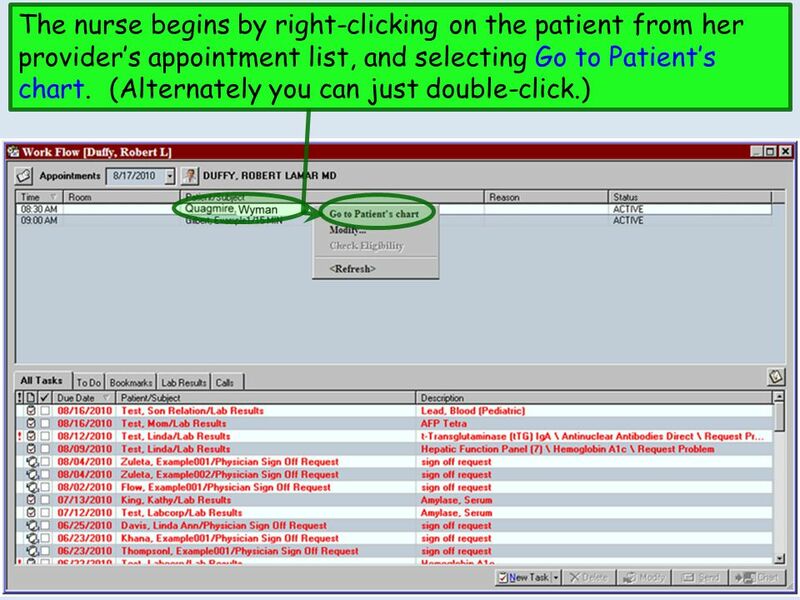 Click Patient Plan. A visit summary is produced (our letterhead will be added). 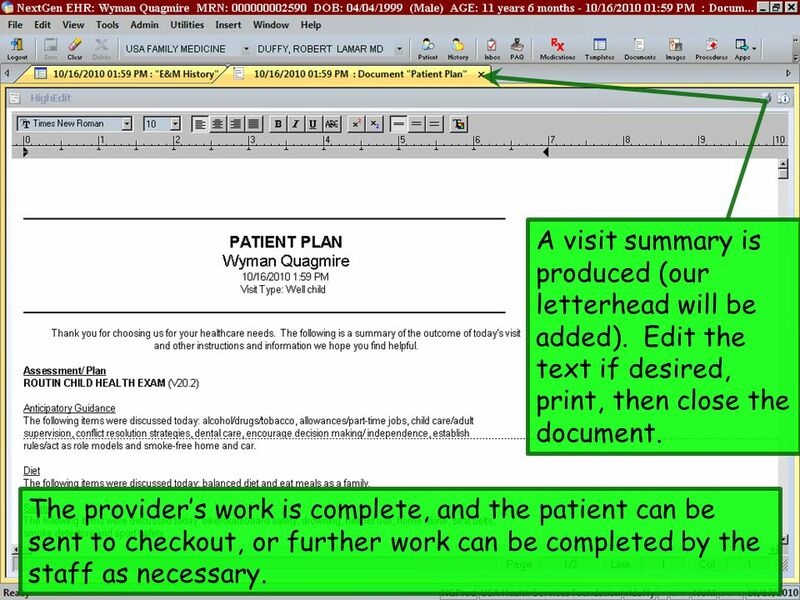 Edit the text if desired, print, then close the document. 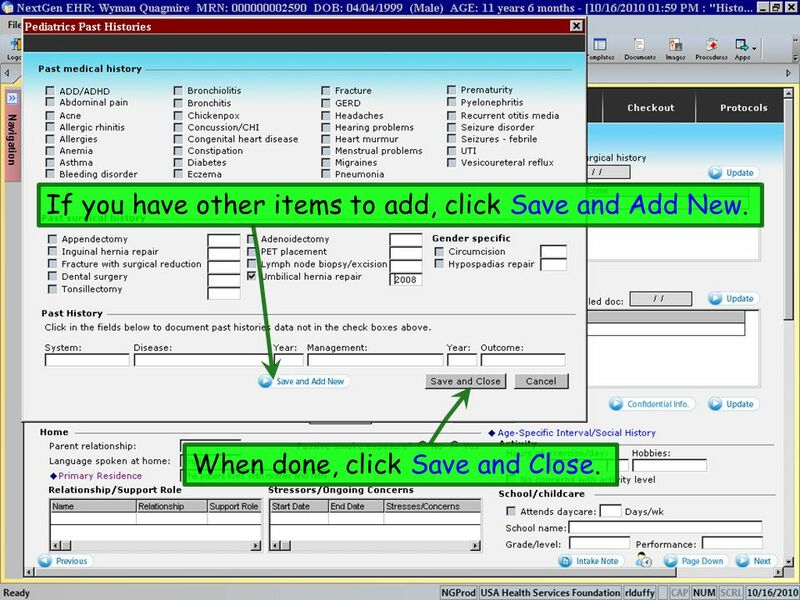 The provider’s work is complete, and the patient can be sent to checkout, or further work can be completed by the staff as necessary. 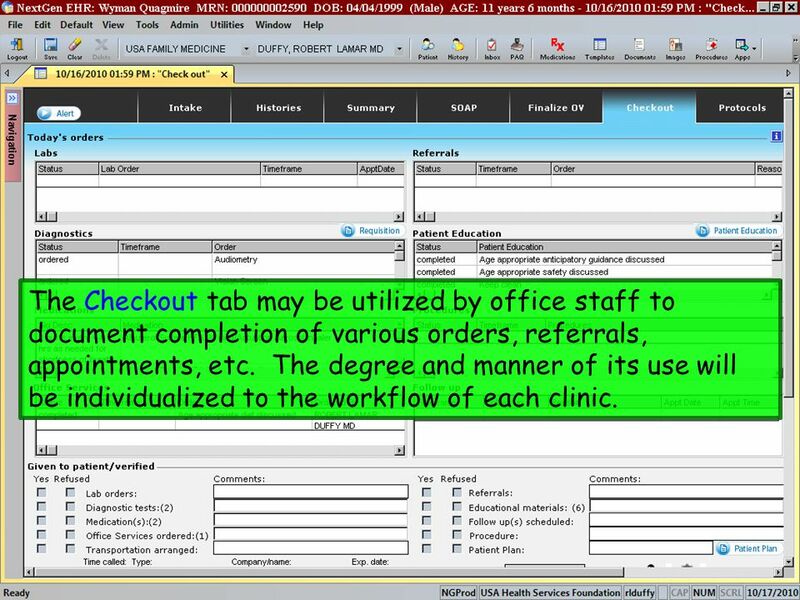 119 The Checkout tab may be utilized by office staff to document completion of various orders, referrals, appointments, etc. The degree and manner of its use will be individualized to the workflow of each clinic. 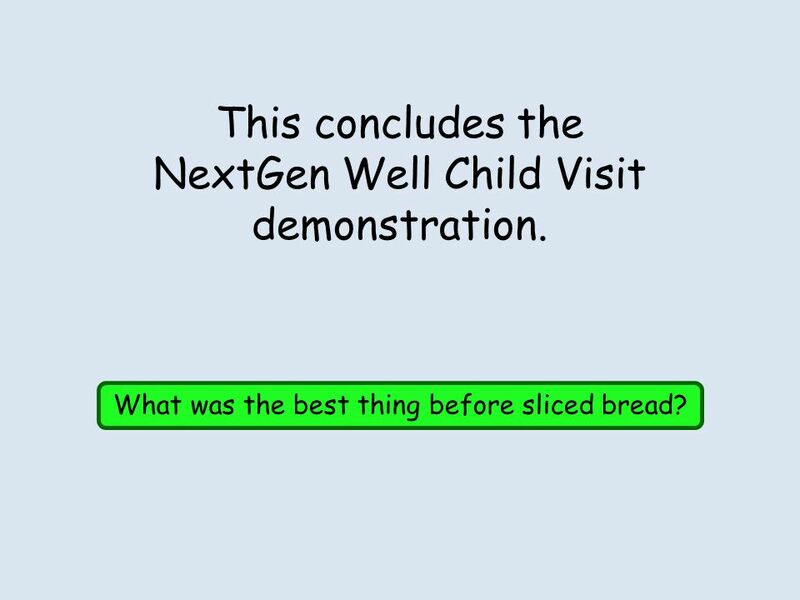 120 This concludes the NextGen Well Child Visit demonstration. 121 This concludes the NextGen Well Child Visit demonstration. 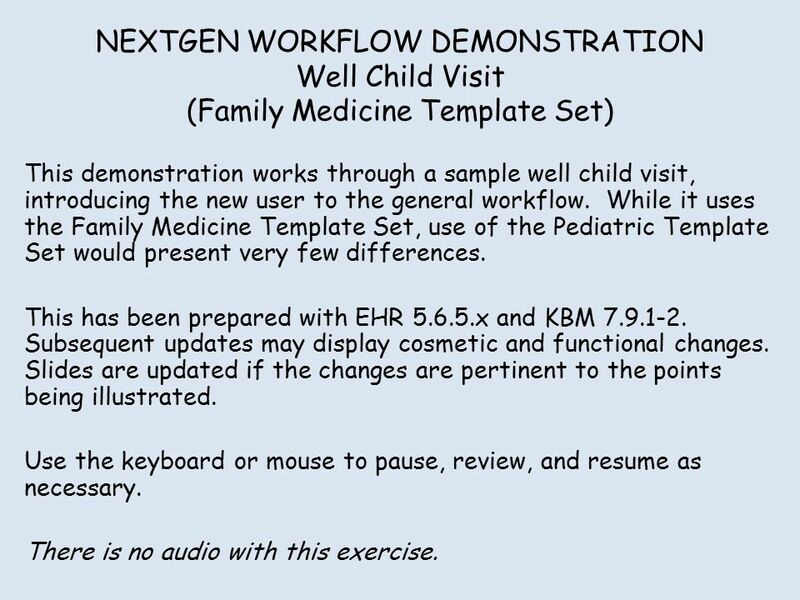 Download ppt "NEXTGEN WORKFLOW DEMONSTRATION Well Child Visit (Family Medicine Template Set) This demonstration works through a sample well child visit, introducing." Setting Up a Custom Gradebook Logon to GDP and click Instructor options. Then click LAN Gradebook and Create New Class to create a class in which a Custom. NEXTGEN PROTOCOL SETUP DEMONSTRATION This demonstration reviews the setup of Protocols for patients in KBM 7.9. Details of the workflow will vary somewhat. NEXTGEN REFERRALS AND DIAGNOSTIC STUDIES DEMONSTRATION This demonstration reviews the ordering of referrals and diagnostic studies in NextGen. Details. 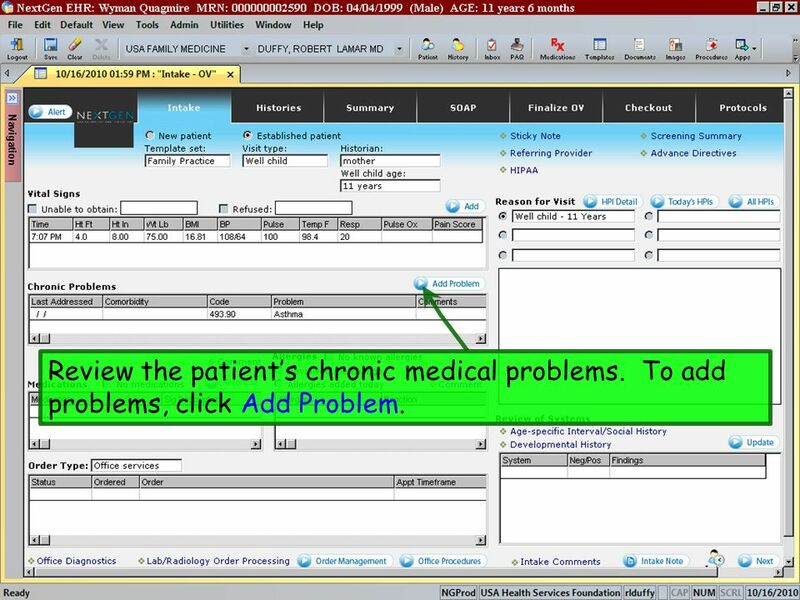 NEXTGEN PROBLEM LIST MAPPING Demonstration & Troubleshooting This demonstration reviews what has happened in the transition from the Chronic Conditions. 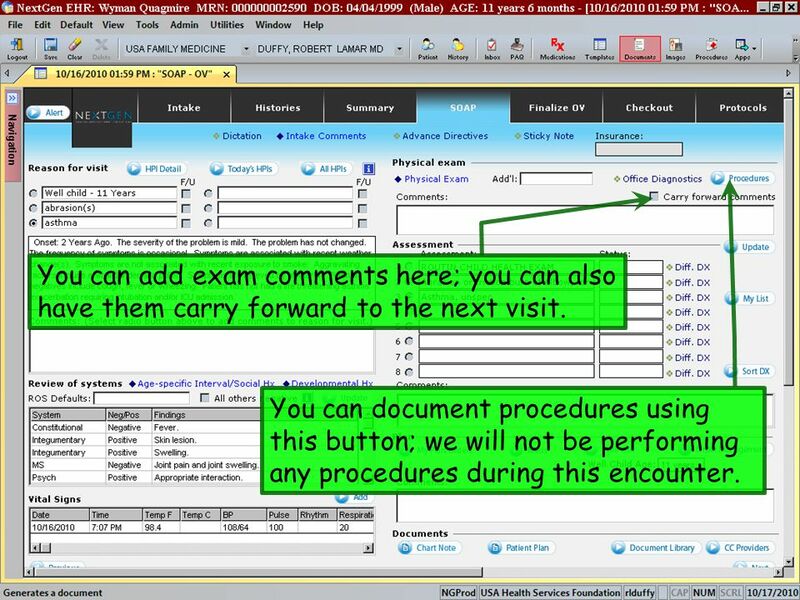 NEXTGEN ASSESSMENT, PLAN, DIAGNOSTICS, & REFERRALS DEMONSTRATION This example illustrates the process of choosing assessments & documenting plans in NextGen.